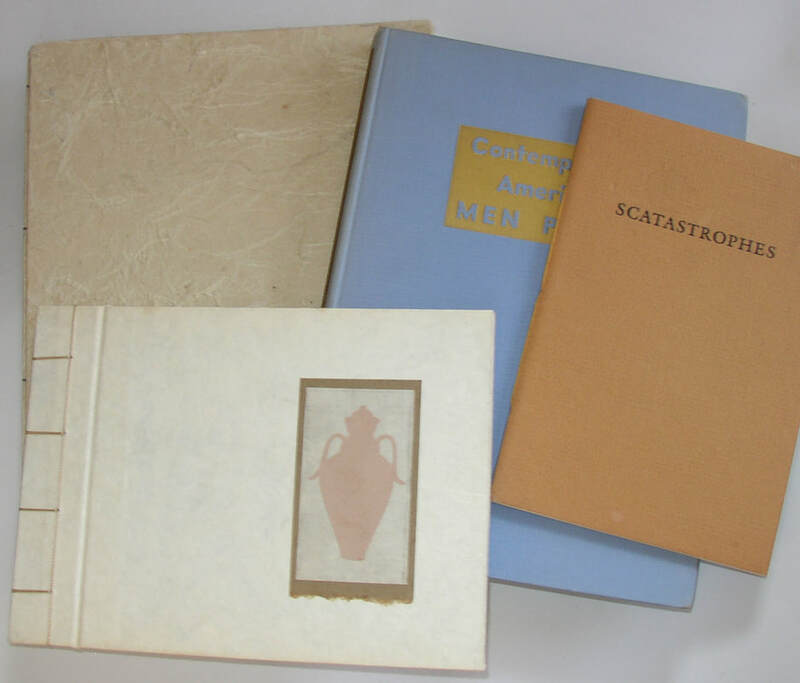 Book Lots 451-500 - Mike Clum Auctions Inc.
Includes: Percy Bysshe Shelley, Plato’s Banquet (Boston: Riverside, 1908); one of 440 total copies: a very fine Bruce Rogers production. 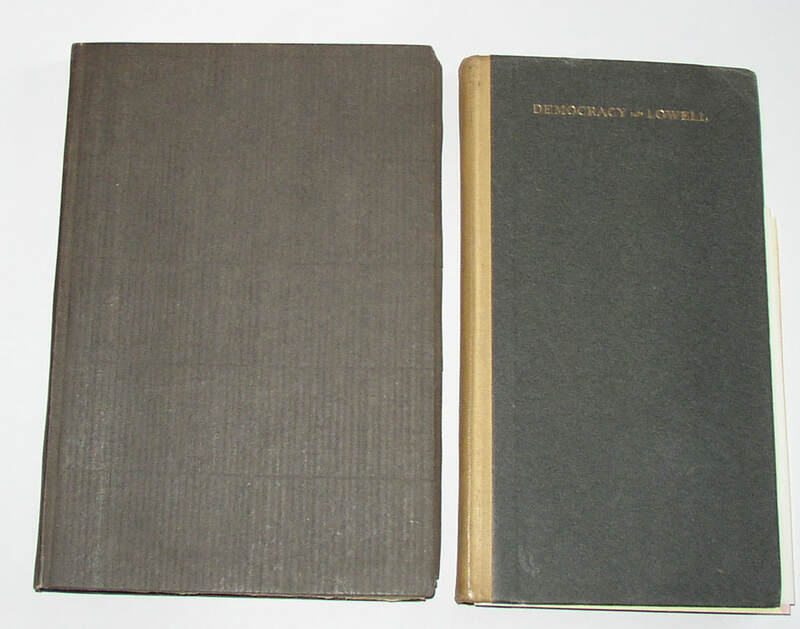 James Russell Lowell, Democracy (Boston: Riverside Press, 1902. 1 of 500 copies, this one unnumbered and marked “Editorial Copy Not to Be Sold.” Two interesting items. Condition: VG or better in each case, but with mild signs of wear, including a couple minor chips where the paper extends beyond the text block on Banquet. 452. 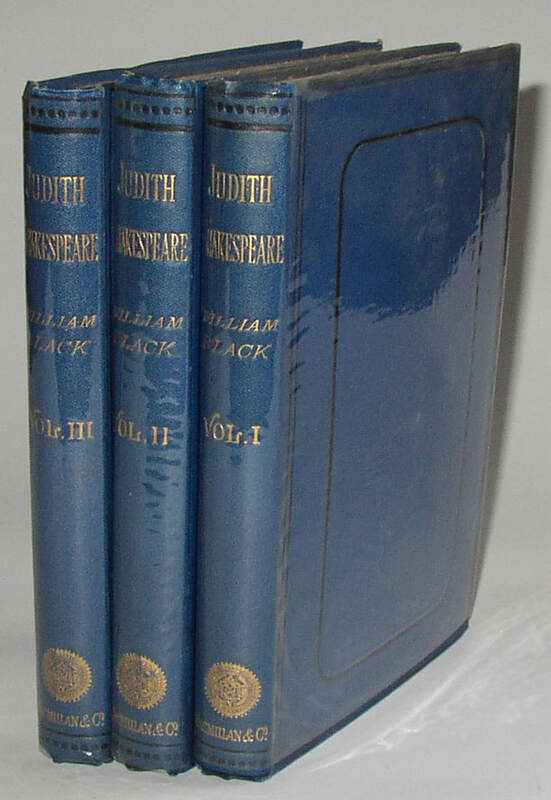 William Black, Judith Shakespeare, 1st edition in three volumes, 1884. London: Macmillan, 1884. An especially sharp copy of this scarce triple-decker first edition. Hard to find, especially such a nice copy in the original publisher’s cloth. Condition: Near Fine, with minor bumps at spine ends; previous owner’s bookplate on the inside front board of each volume. The Pergola, Catalog 39 from the Hartman-Sanders Co, Chicago (1928): 64pp. illustrated by photos of pergolas and products offered. 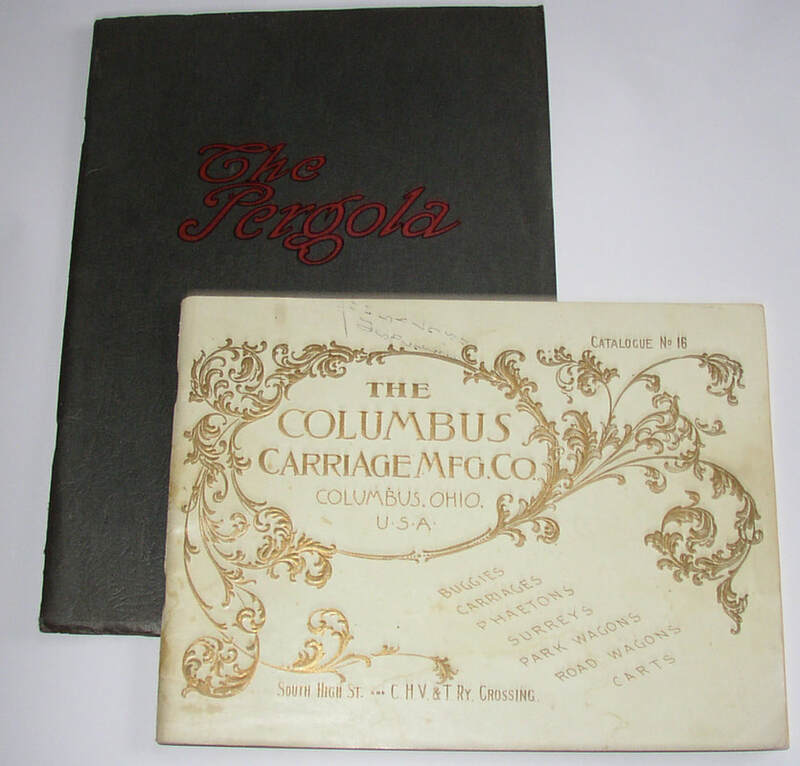 Also: Catalogue 16 from The Columbus Carriage Mfg Co (ca. 1900); OCLC suggests catalogue 15 was dated 1896. 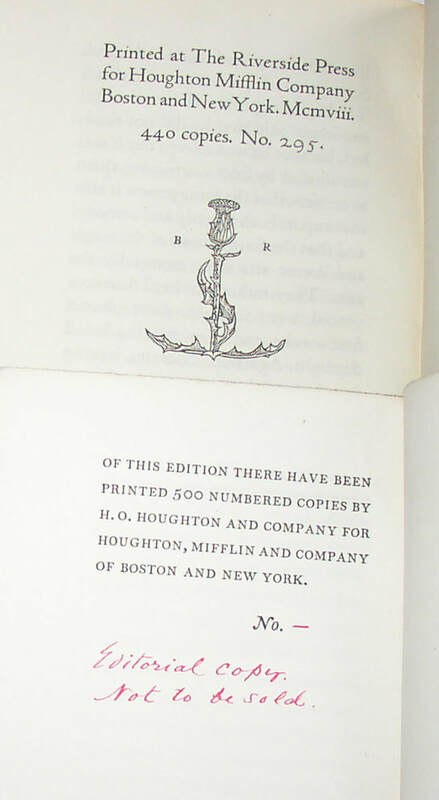 52pp; most with a cut of a carriage printed in black before a green-printed background. Very appealing. 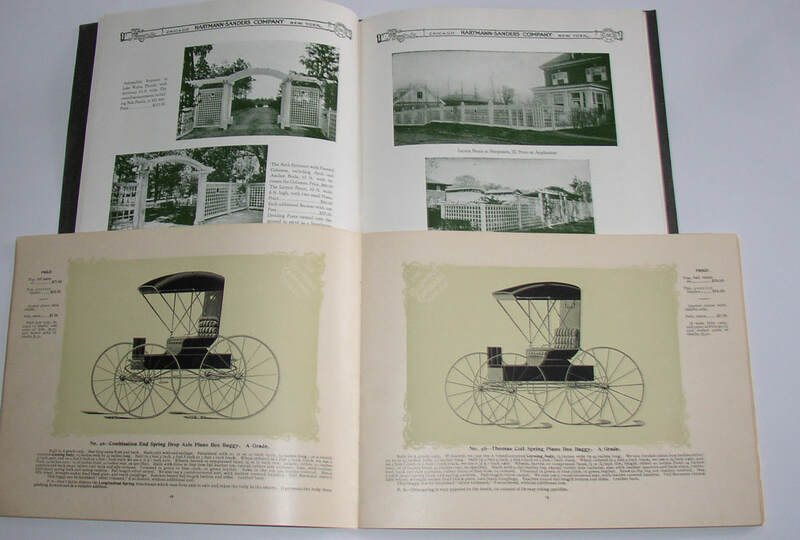 Condition: Pergola catalogue VG or better; unsightly ink writing on back cover of the Carriage Catalogue, else VG. Condition: Near Fine, with a previous owner’s name in pencil inside. 455. George Wolfe Plank, et al, eds. 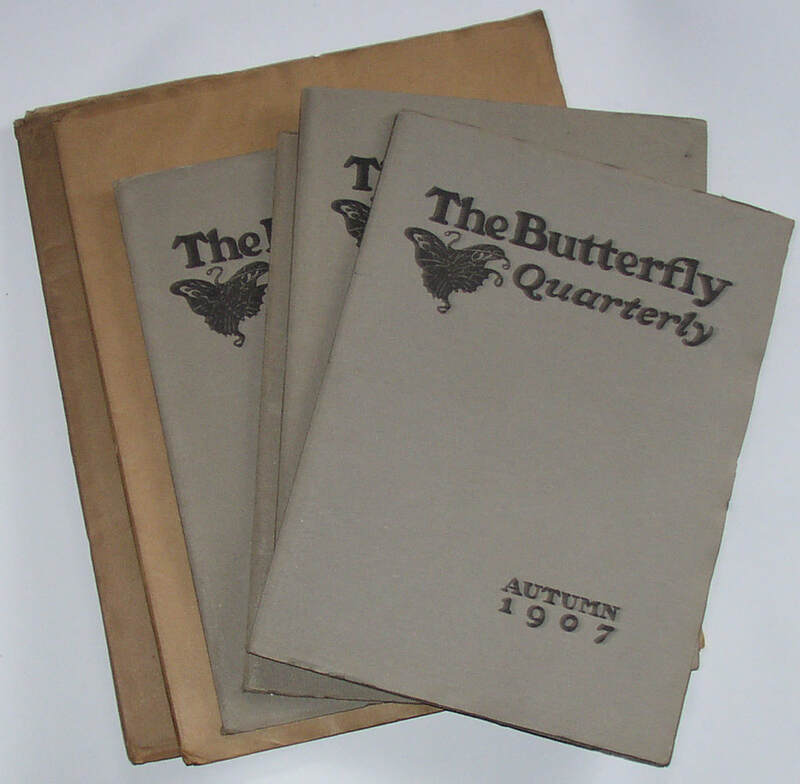 The Butterfly Quarterly, complete run, 7 issues. 1907-1909. A large format literary journal that often included hand-colored elements and tipped in woodcut prints and engravings. With advertising for Thomas Mosher and for the Roycrofters, it’s clear that Plank saw this journal as fitting in with the arts and crafts esthetic of the early 1900s. The first four numbers limited to only 500 copies; the last three limited to 300 copies. This set mostly or entirely unopened. Condition: VG or better: pages uncut; covers with some wear around the edges. 456. 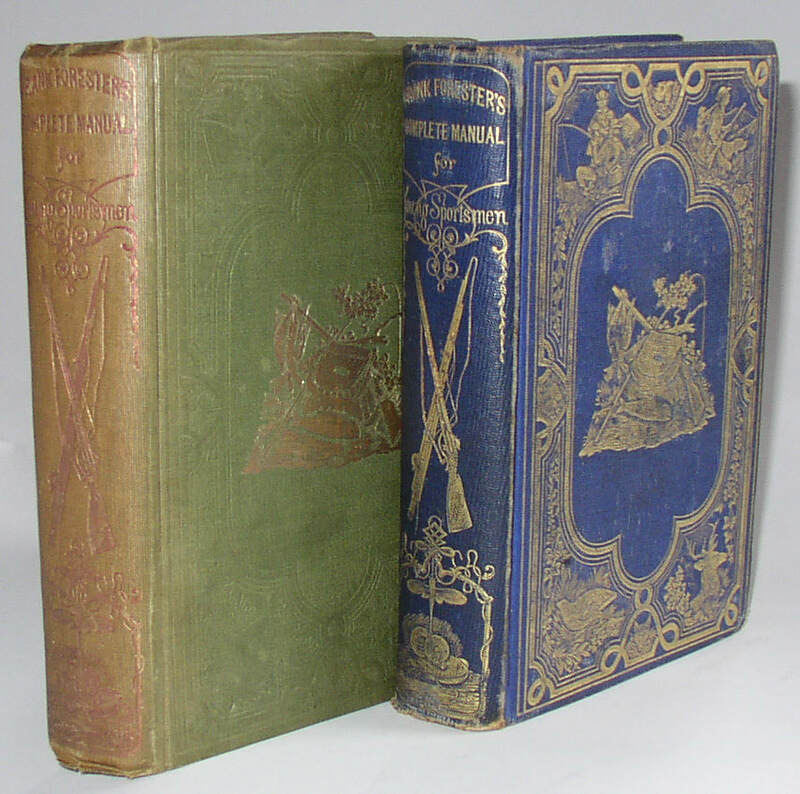 Frank Forester/Henry William Herbert collection of 1st edition books, 1842-56. 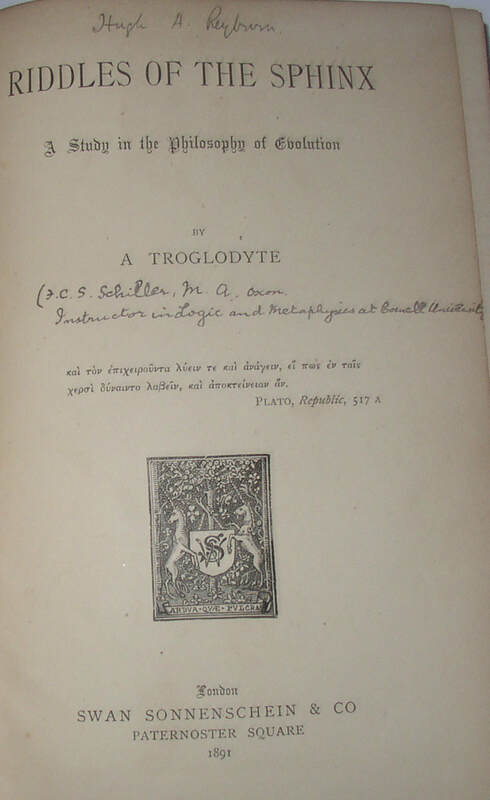 Includes: A) Herbert, The Prometheus and Agamemnon of Aeschylus (Cambridge, MA, 1849); close to Near Fine. B) Forester, ed,, Sporting Scenes and Sundry Sketches of J. Cypress, Jr. (New York, 1842); 2 vols; brown cloth with gilt titling on spines; VG+; C) Forester, Complete Manual for Young Sportsmen (New York, 1856); Green cloth with gilt on spine and front board; spine angle, wear at spine ends and fading to spine; internally clean, near VG. D) Another copy, in blue cloth, extensive gilding on front board, rear board, and spine; all page edges gilded. Near VG, now housed in a custom case. 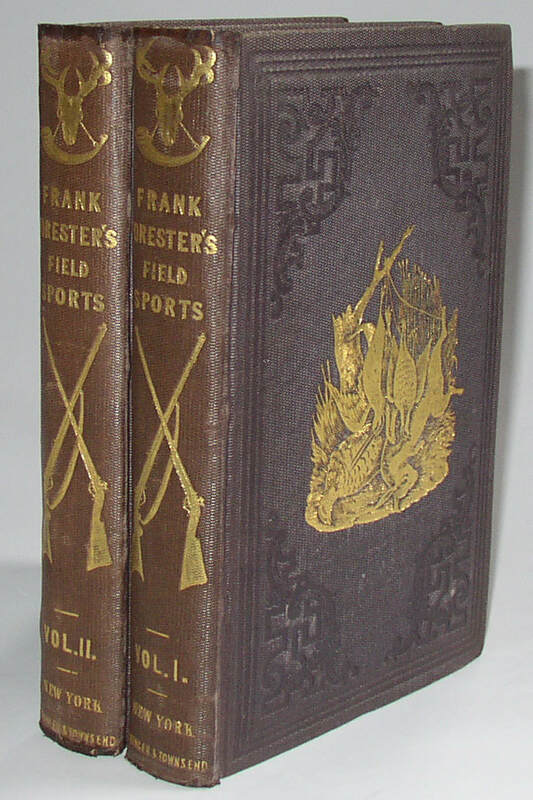 E) Frank Forester’s Field Sports (New York: Stringer & Townsend, 1849), sharp clean copies in brown cloth with gilding. Wear to cloth at spine ends; bookplates on inside front board of both volumes: VG+; now held in a custom case. A nice little lot from this author! 457. 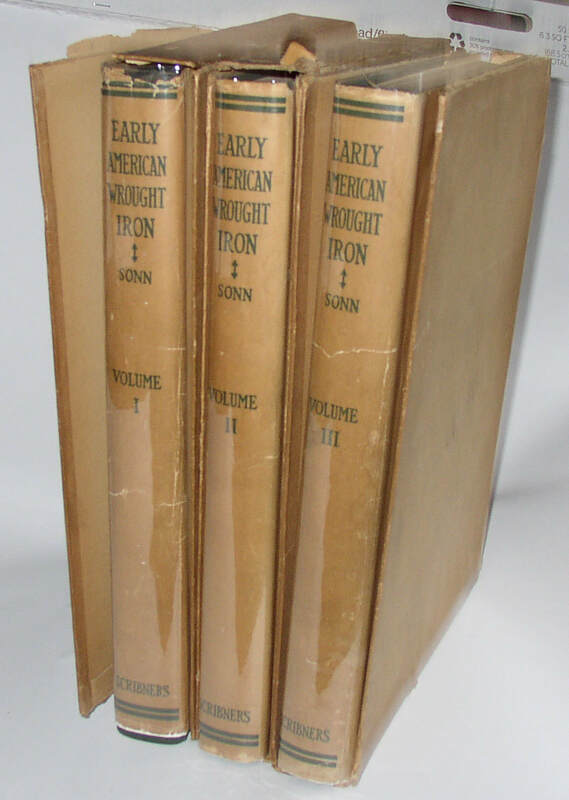 Albert Sonn, Early American Wrought Iron, 1st edition in dust jackets and slipcases. New York: Scribner’s, 1928. Green cloth bindings. 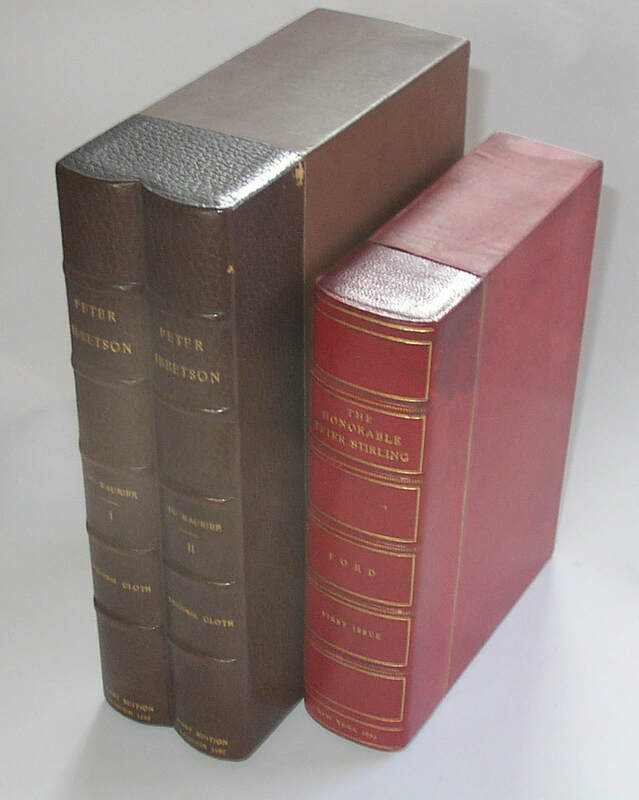 A classic set of three volumes on the topic of American wrought iron; this copy extremely unusual for retaining the original dust jackets and slipcases, though the slipcases, in particular, have some condition issues. The set originally cost a massive 35.00 when new. Condition: Books near fine, with some ink stamps from a prior owner. Jackets about VG. 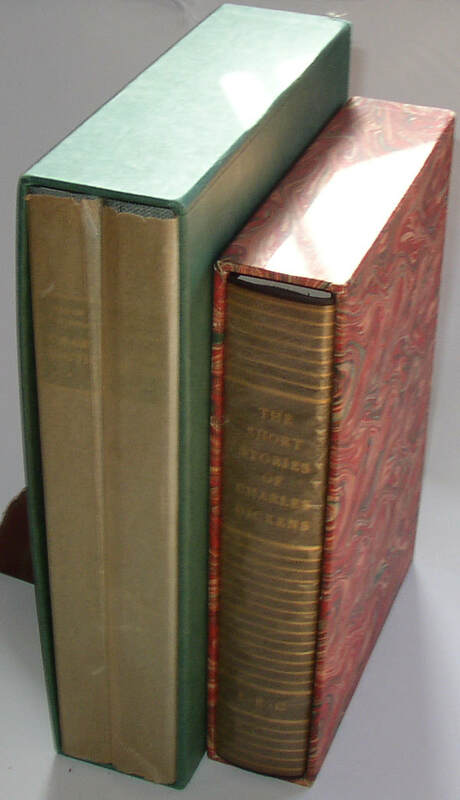 Slipcases poor, with two having lost at least one narrow side. They could be stabilized, I think. 458. Two rare scientific studies of solar system dynamics: The Orbit of Neptune (1848) and Report on Total Eclispse of the Sun (1910). The earlier of these two items is “The Orbit of Neptune” computed by Sears C Walker and “Formulae in the Theory of Neptune” by Benjamin A Peirce, [reprinted or off-printed] from The Proceedings of the American Academy (Boston, 1848). A key American contribution to the proper identification of Neptune and its orbit. 8pp, uncut, as issued. Very scarce. 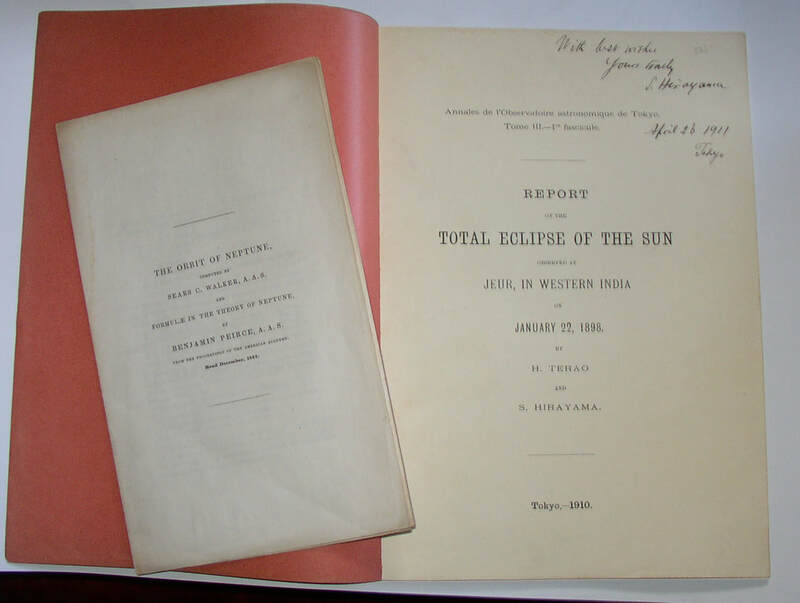 The second item is H Terao and S Hirayama, Report on the Total Eclipse of the Sun Observed at Jeur in Western India on January 22, 1898, printed in Tokyo in 1910, and inscribed (in English) by Hirayama, and dated April 26, 1911. Both are accompanied by detailed descriptions from an earlier bookseller. Both very scarce. Condition: Eclipse with splitting at the spine corners of the paper; otherwise NF overall. 459. 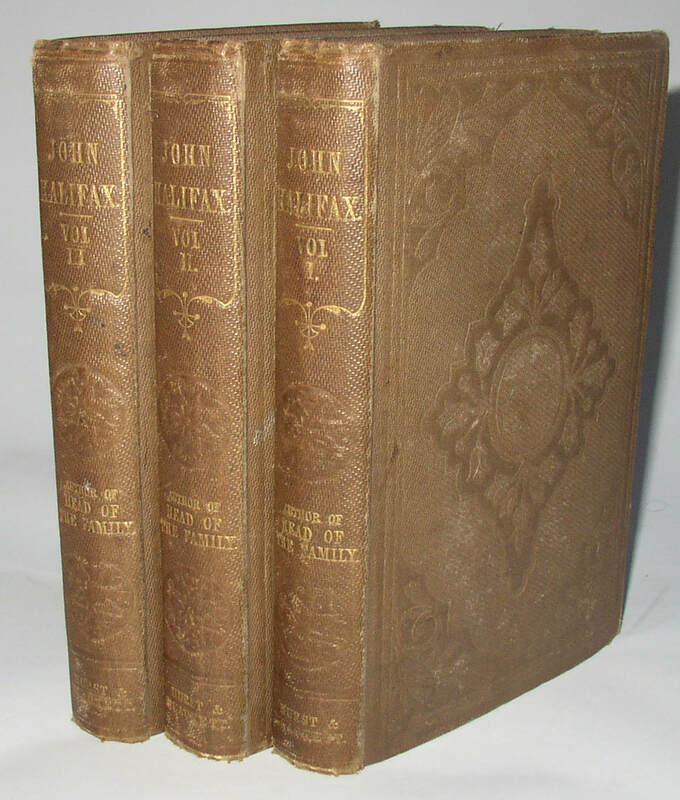 [D M Mulock Craik], John Halifax, Gentleman. 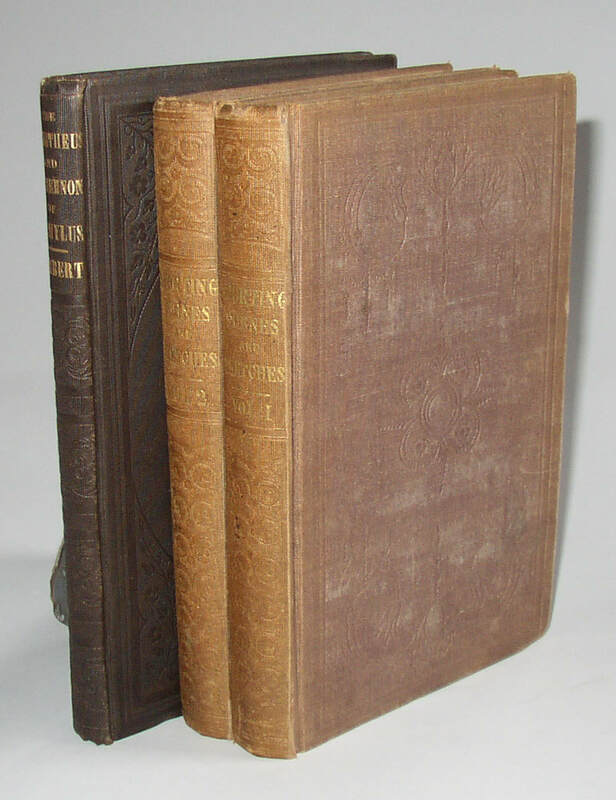 Scarce and collectible 1st edition, 3 volumes. London: Hurst and Blackett, 1856. Scarce first edition in original cloth bindings of a very popular Victorian novel. With 3 pages of ads, 1 page, and 2 pages, in the three volumes. An attractive copy. Condition: some spine roll, and the rear hinges are weakening/splitting on two volumes. Overall between Good and Very Good, I think. Non-authorial gift inscription in volume 1; in a clamshell box. 460. 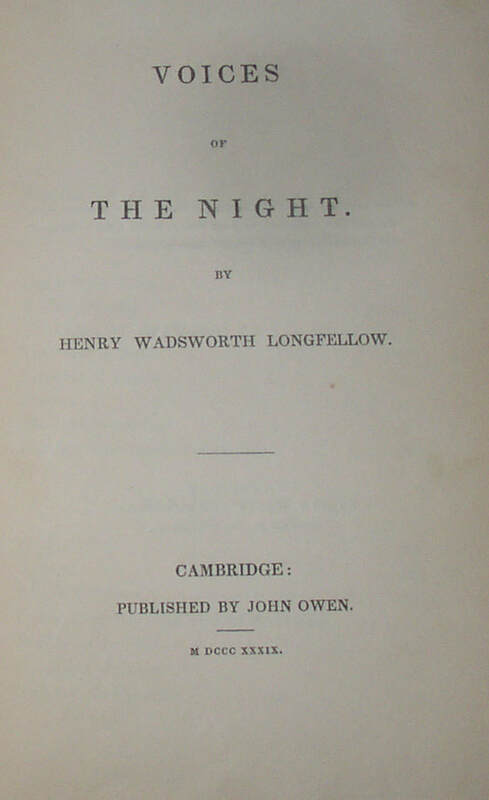 Henry Wadsworth Longfellow, Voices of the Night, 1st edition (1839). Cambridge: John Owen, 1839. Second state, with “The arm of Hector” on page 78; Original binding of paper covered boards with printed spine label. First book by this poet. Condition: About Good, with significant wear, and chipping at ends of spine. 461. John M’Culloch, A Concise History of the United States . . . with a correct map (1795). Philadelphia: John M’Cullouch, 1795. The 1795 date appears on the title page and also the bottom of page 4 reads “Philadelphia, August 1, 1795/ FIRST EDITION”. 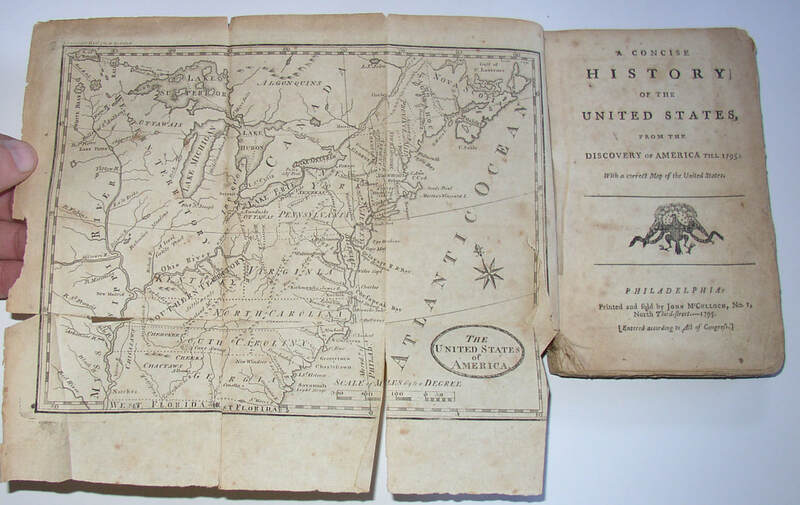 And the full title of the book indicates that is covers history “From the Discovery of America till 1795.” Stated first edition. The folding map is present and complete, but with some tears from rough opening. 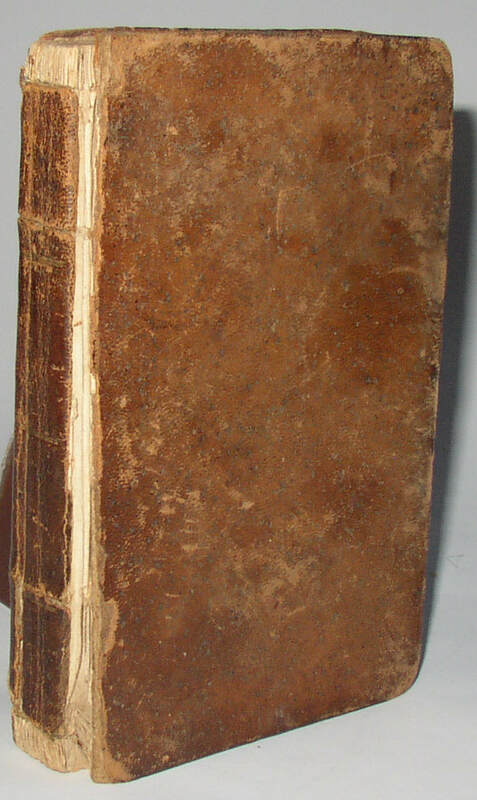 Original brown leather binding. Scarce on the market. Condition: map with tears, as noted. Binding showing significant wear; front board very nearly detached and holding by a thread. 462. 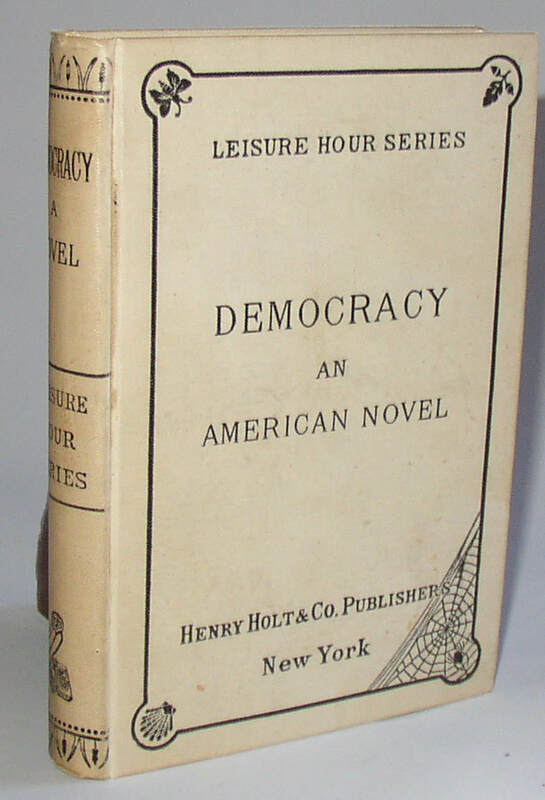 Henry Adams, Democracy An American Novel, scarce first edition, a beautiful copy. New York Henry Holt, 1880. 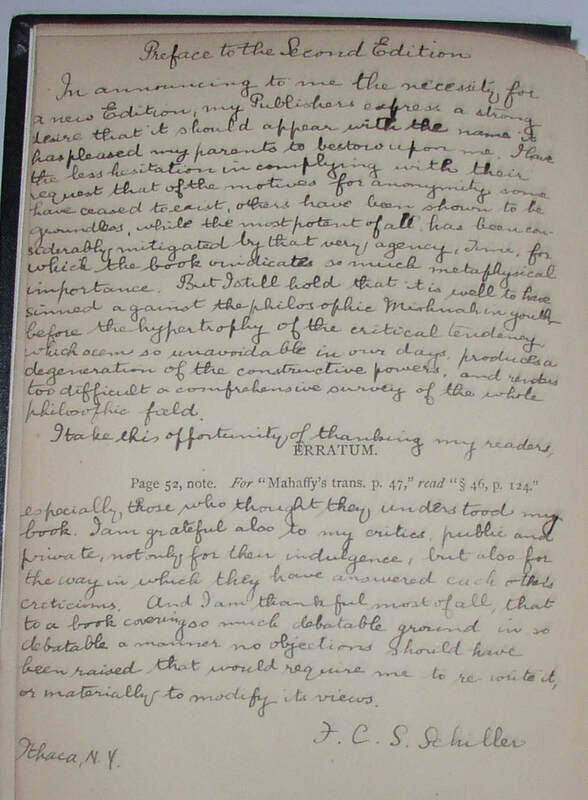 Apparent first state or first issue, with end-paper dated March 31, 1880, and with gathering signature F visible on p. 65. Leisure Hour Series—No. 112 on title page. Condition: minor darkening to spine; otherwise Near Fine: very clean and attractive. 463. 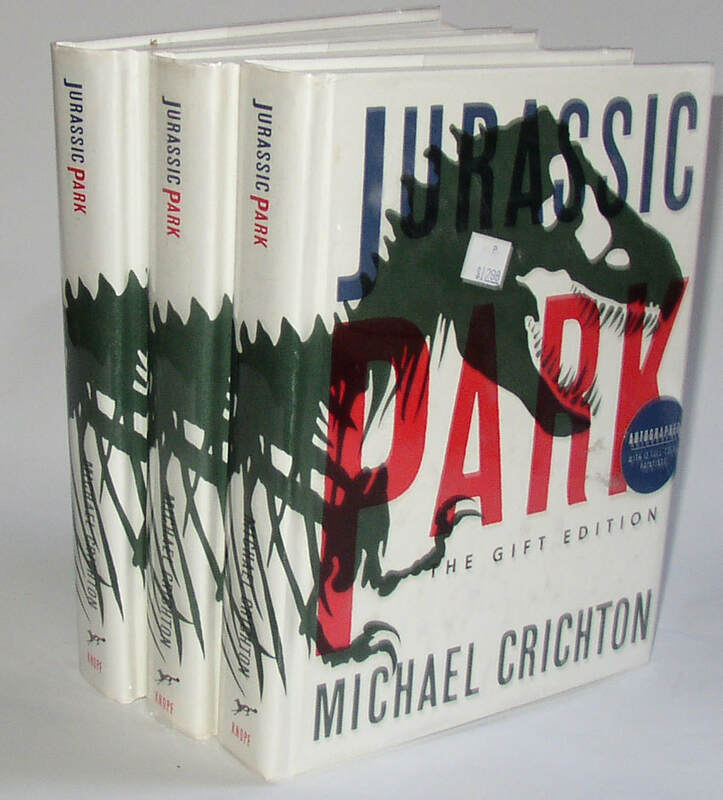 Eight modern signed limited edition books: Jurassic Park, Sarah, Duchess of York, Civil War. Includes: 3 copies of Michael Crichton’s Jurassic Park, Autographed Gift Edition; 2 copies of Budgies, by Sarah Ferguson, Duchess of York (signed with cassette and in publisher’s box) and three copies of Don Troiani’s Civil War, each signed by Troiani on a bookplate affixed to the front free end-paper. Condition: All just about as new. 464. 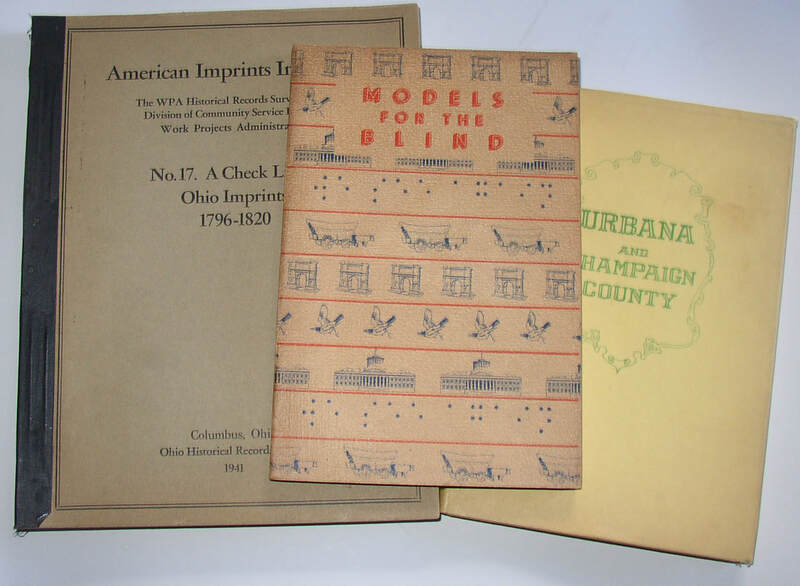 Three scarce Ohio WPA books: Ohio Imprints, 796-1820; Models for the Blind, Urbana. 1941-1942. 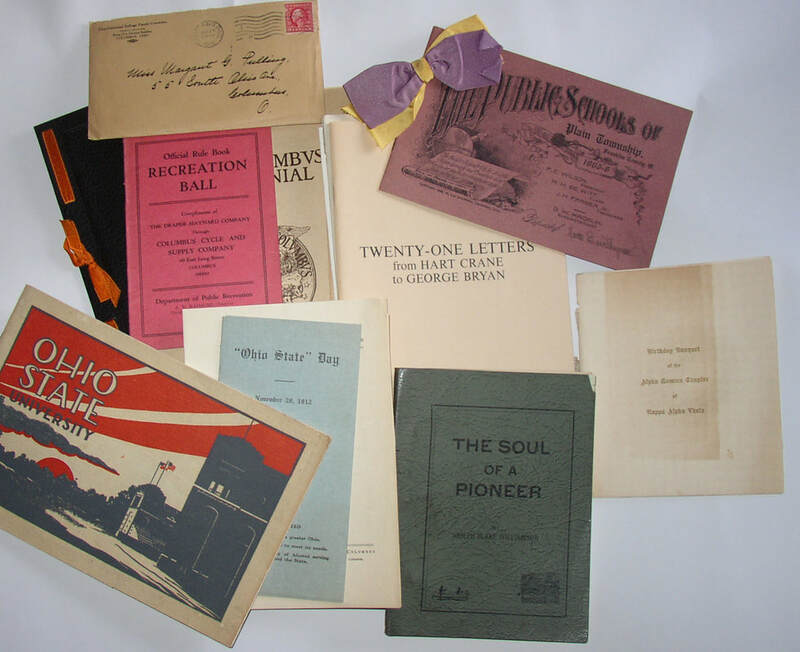 Three works produced by the WPA writer’s project in Ohio. First is American Imprints Inventory, No. 17, A Check List of Ohio Imprints 1796-1820. (1941) Paperbound. VG, with some spitting at spine. Second is Models for the Blind (1941), a record of models used for teaching constructed by WPA works for the Ohio School for the Blind, with numerous illustrations of the models. About Near Fine. 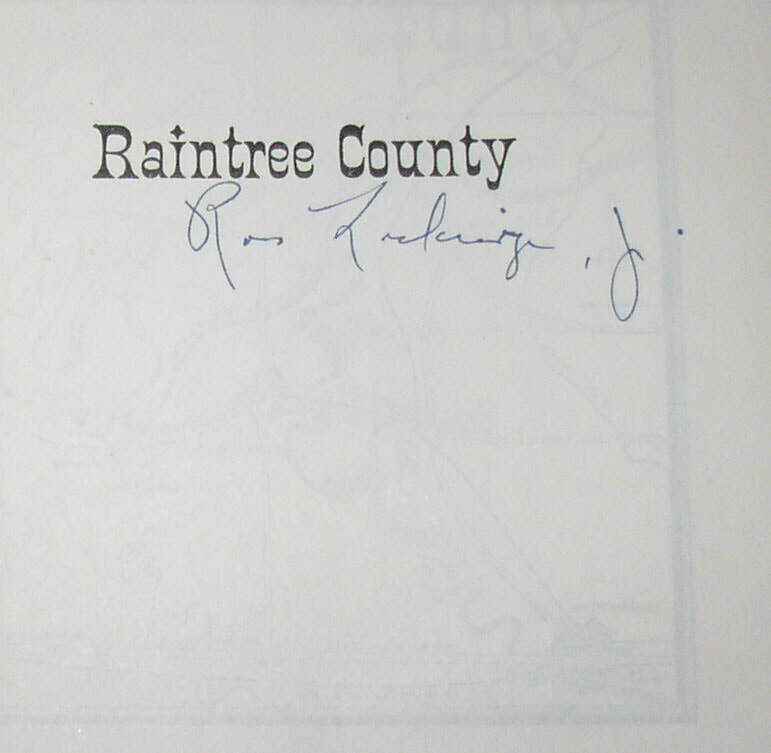 Third is Urbana and Champaign County (1942), hardcover with dust jacket. Part of the American Guides series. NF/VG. All somewhat scarce. 465. 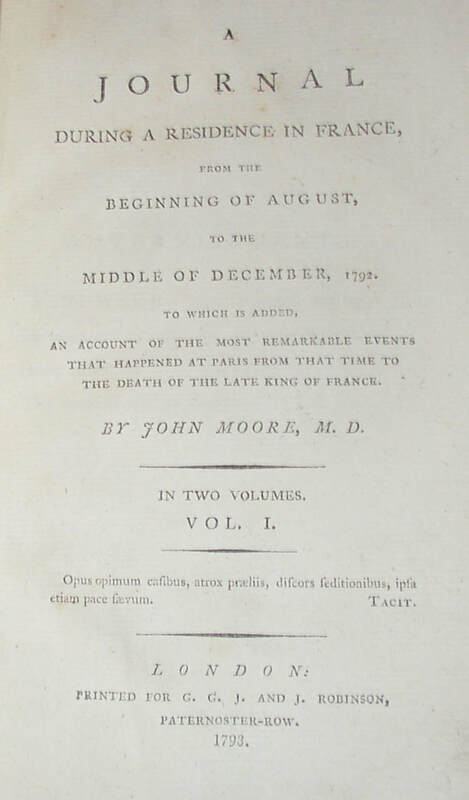 John Moore, Journal During a Residence in France, 1st London edition, 1793. London, 1793. 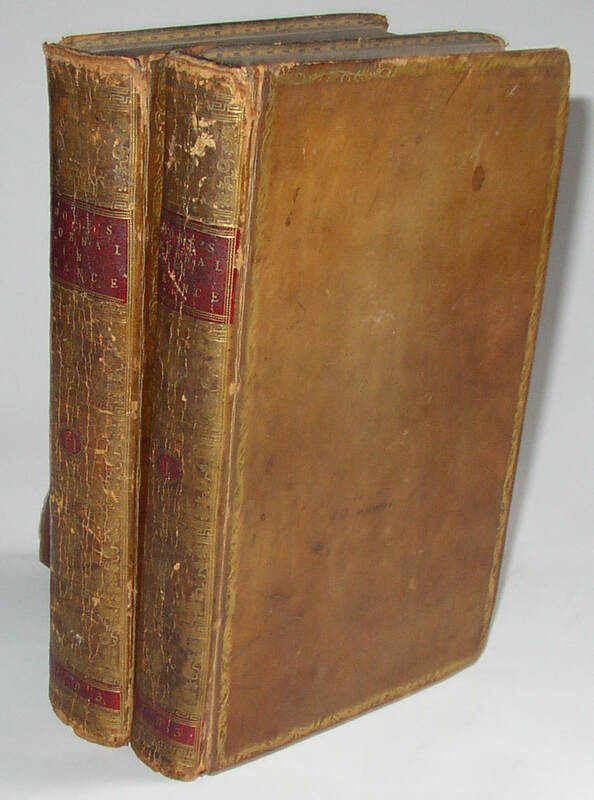 Two volumes in matching brown calf. Interesting historical record of events from 1792 and the French Revolution, including the execution of the king. Internally very clean. Condition: bumping and wear to the leather bindings, especially to the edge and corners. Good or better. 466. 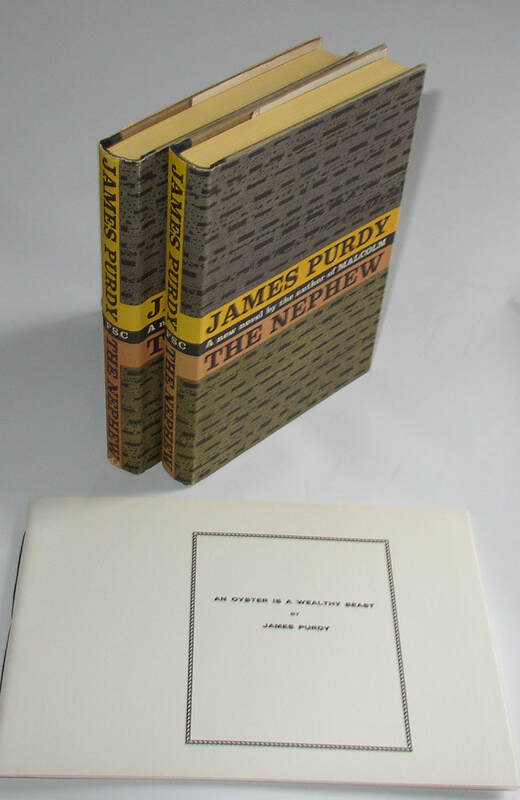 Three 1st edition books by James Purdy, 2 signed: The Nephew; An Oyster. 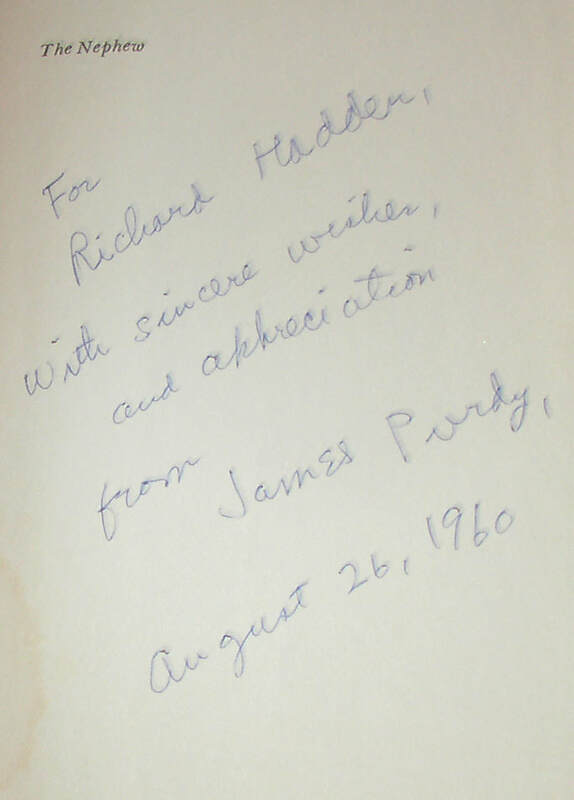 The Nephew (New York, 1960); two first editions in dust jackets, one signed and inscribed by Purdy on the half-title page, and dated in 1960; And: An Oyster is a Wealthy Beast (San Francisco, 1967) softcover; number 59 of the signed limited edition of 200, this copy with a sketch (initialed by Purdy) on the blank immediately before the beginning of the text; it seems that the limited hardcover edition usually included the sketch, which is presumably of an oyster; at least some softcovers seem also to have had the sketch, as here. Unusual. Condition: Unsigned Nephew about VG/VG; other two books close to Fine. 467. 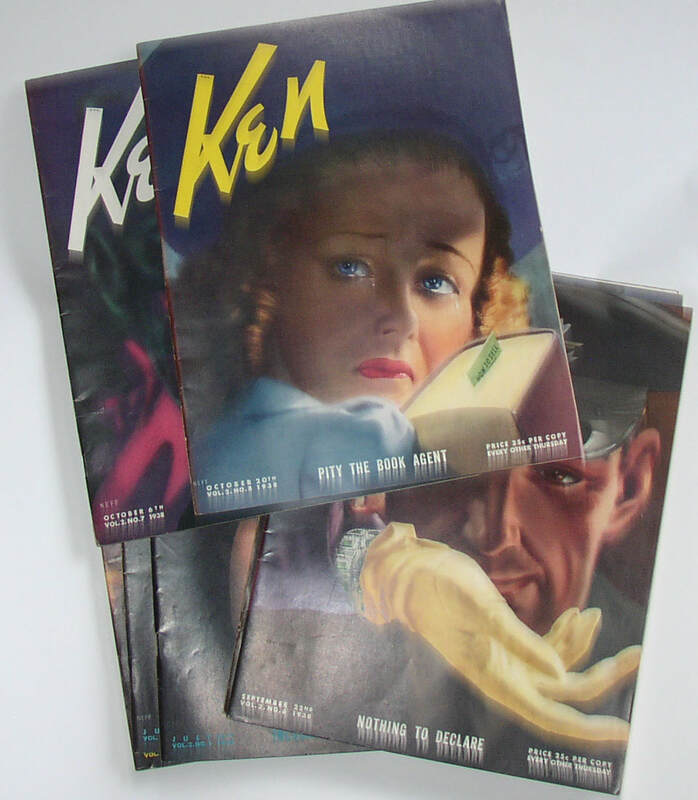 Full (or nearly full) run of Ken magazine, with Ernest Hemingway contributions. 1938-1939. A fairly short-lived large-format illustrated magazine; the first fourteen numbers of which included Hemingway contributions; I believe this lot contains vol. 1 nos. 1-7, plus vol. 2, nos, 1-10, plus another 18 or so later issues. 35 total issues, if I’ve counted correctly. 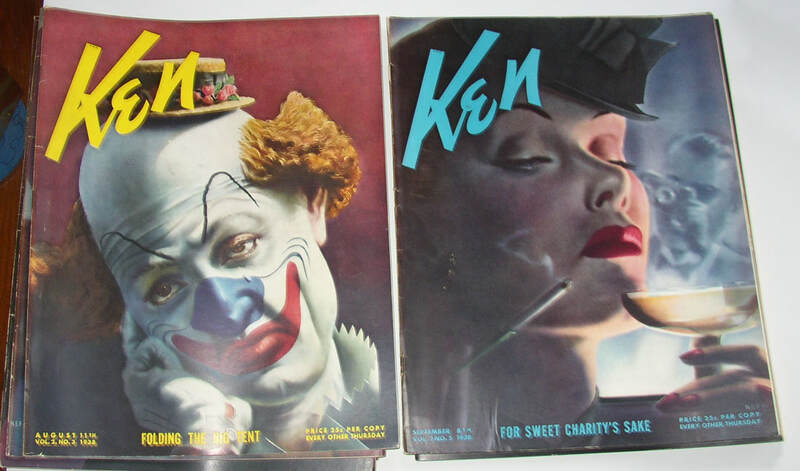 With: several issues of Life magazine, including a small format copy of issue 1. Condition: visually appealing, but some issues with splitting to the covers at the spine, occasionally reaching up to the staples. 468. 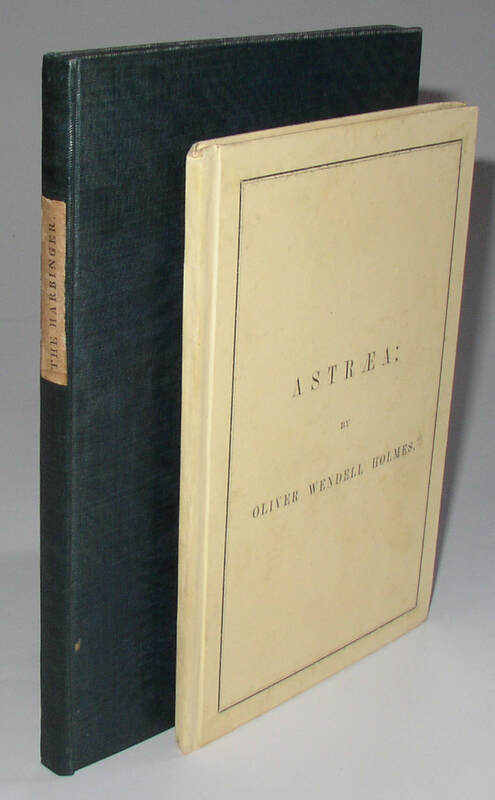 Oliver Wendell Holmes, Harbinger and Astraea, both 1st editions. The Harbinger (Boston: Carter Hendee & Co, 1833). Part II of this book is made up of poems by Holmes; his first poems in a book. A beautiful copy: close to Fine, with minor signs of age. Astraea (Boston: Ticknor, Reed, and Fields, 1850). First edition, with four-page catalogue at the front. 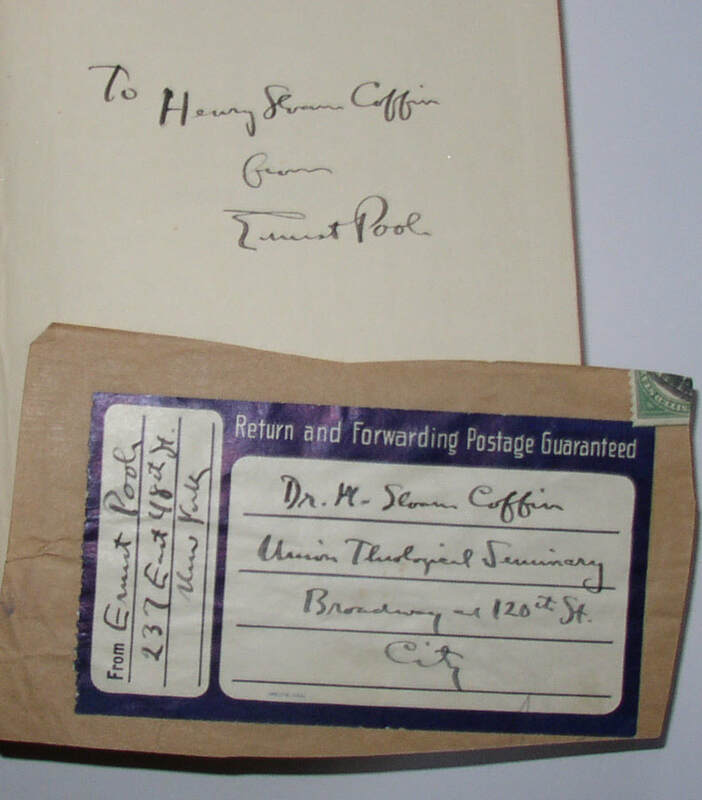 An unopened copy, about Fine, but for a previous owner’s bookplate to the leaf before the title. Very clean and attractive. Condition: Both books in exceptional condition, as noted. 469. 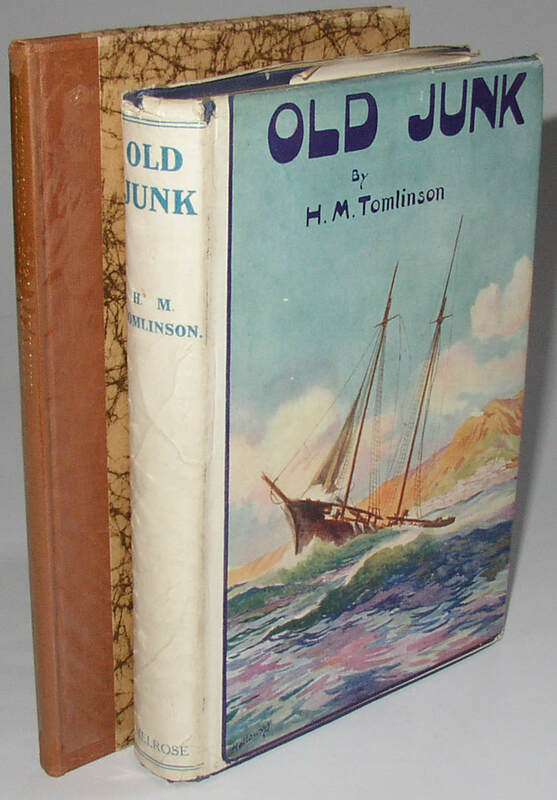 H M Tomlinson, 2 1st editions, Illusion 1915 signed, and Old Junk in dust jacket. Old Junk: London: Melrose, 1918. 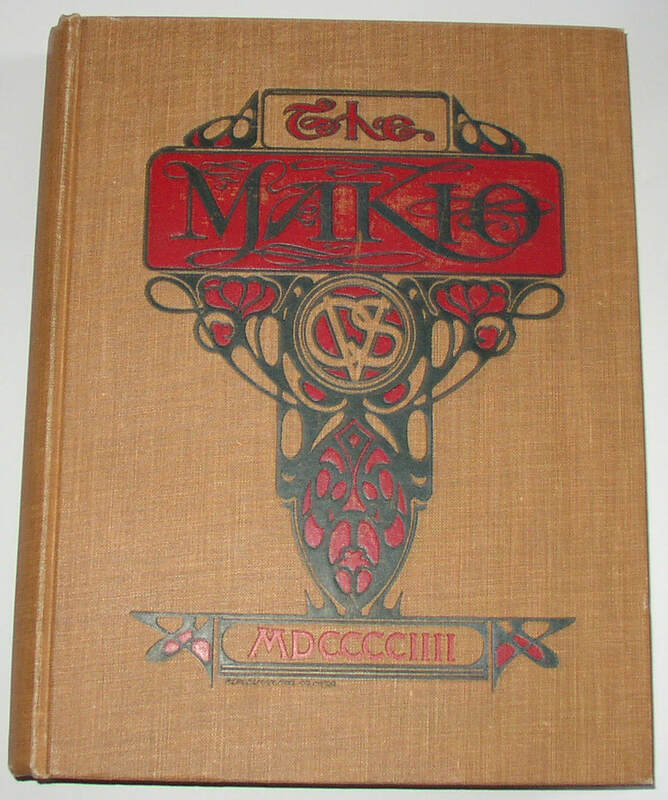 First edition in original dust jacket. 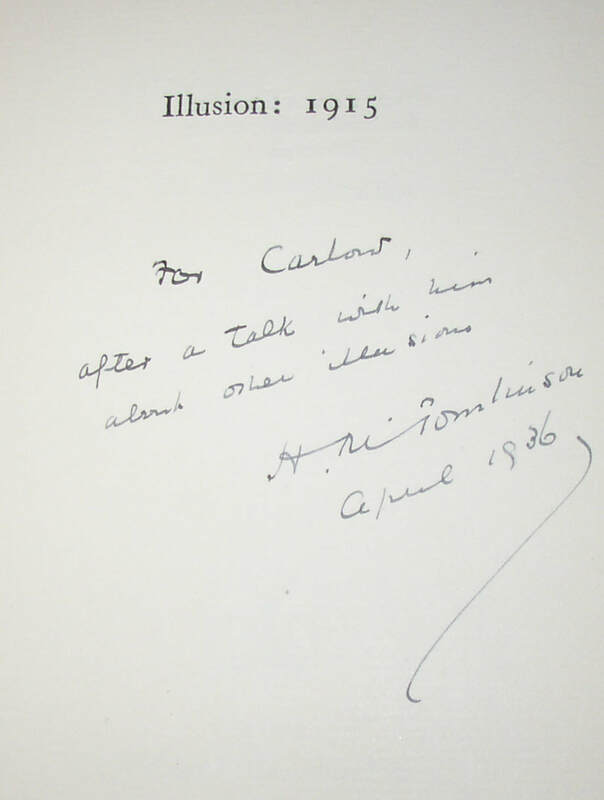 Illusion: 1915 (London: Heinemann, 1929); one of 500 copies signed on the limitation page by Tomlinson; this copy also signed and inscribed on the half-title by Tomlinson in 1936. Condition: Illusion is about Fine; Old Junk is NF/VG, with some wear and minor chipping to the jacket. Fiction, Philosophy, and Memoir. All somewhat unusual or rare. Includes: Poole, Silent Storms (1927 UK 1st ed, signed and inscribed); Singh, Leaves from my Diary (Lahore, 1946, first ed. 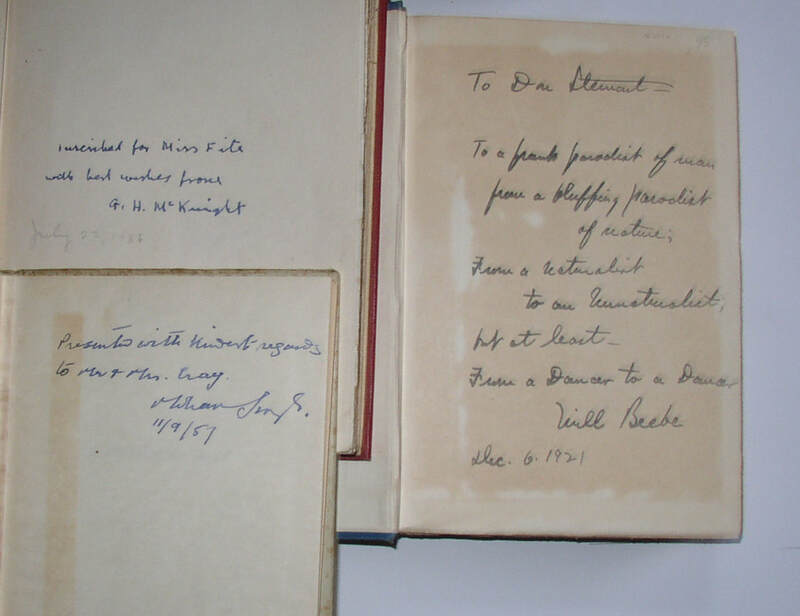 in dj, signed and inscribed in 1957); Beebe, Edge of the Jungle (1921 1st ed, no dj; signed with a lengthy inscription; McKnight, St Nicholas (1917 1st ed, no dj, signed and inscribed in 1936); and Schiller, Riddles of the Sphinx (1st edition, apparently the very copy used by the author to provide the preface to the second edition, with the new text written in, and his signature, and affiliation, etc, added. I don’t see changes made to the text itself.). Condition: Varying from G to VG. Schiller is a library rebind, and ex-library. 471. Lot of 5 collectible signed science fiction and fantasy books; three are 1st editions. 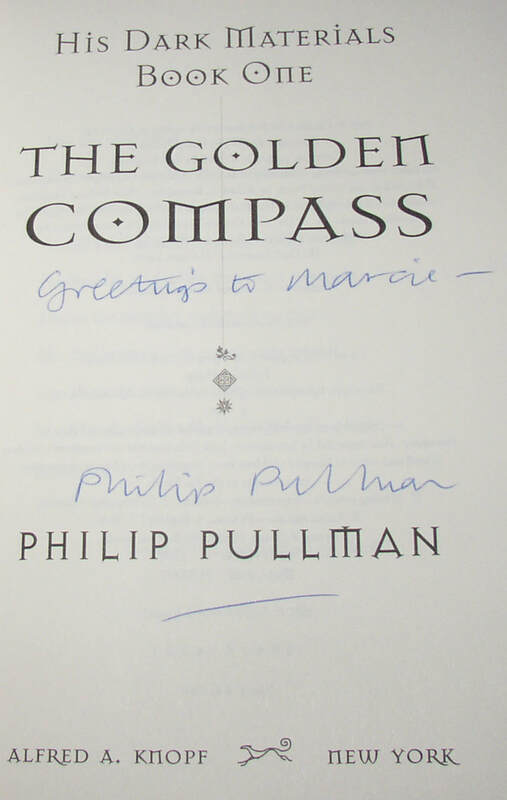 Includes: A) Philip Pullman, The Golden Compass (Knopf, 1996), first edition first printing, signed and inscribed on the title page by Pullman. B) Philip Jose Farmer, Love Song (signed limited edition from 1973, number 170 of 500); hard bump to top of spine, affecting book and jacket both. 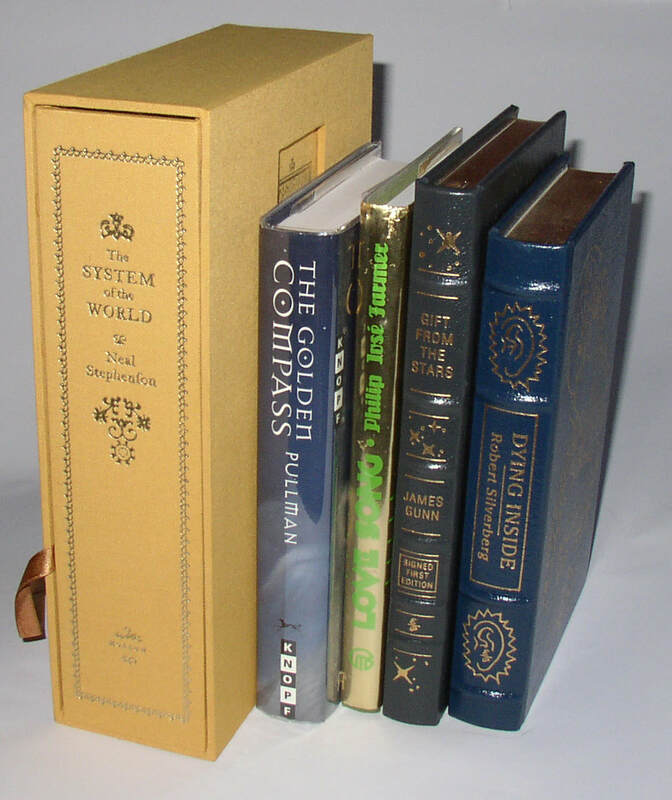 C); James Gunn, Gift from the Stars (Easton Press signed first edition, 2005; one of 900 copies); Robert Silverberg, Dying Inside (Easton Press signed Collector’s edition, 2004); Neal Stephenson, The System of the World (Morrow, 2004; signed limited edition, one of 1000 copies in hard slipcase. Condition: All 5 books about NF or better, as a rule. 472. 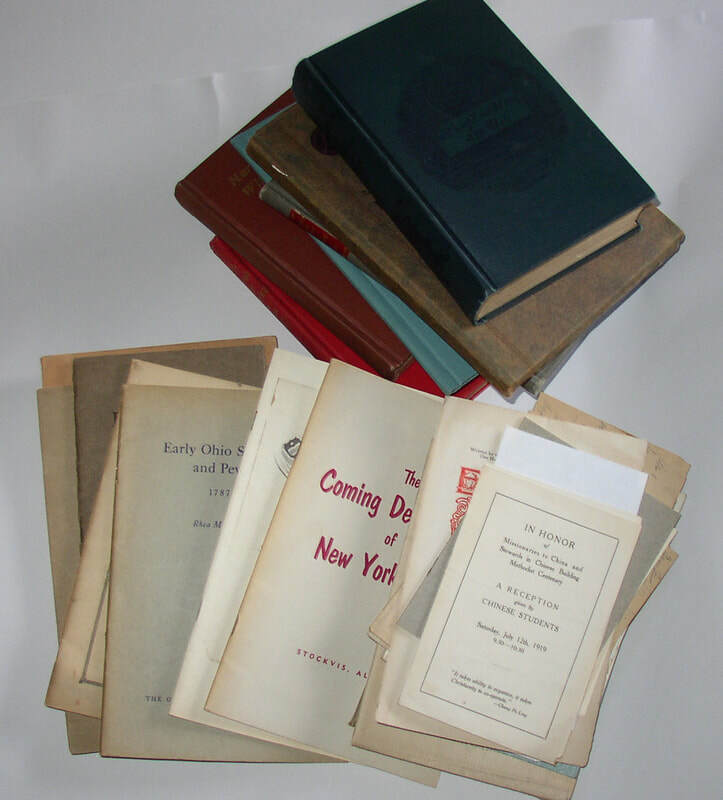 Lot of literary magazines and journals, 1930s to 1970s. 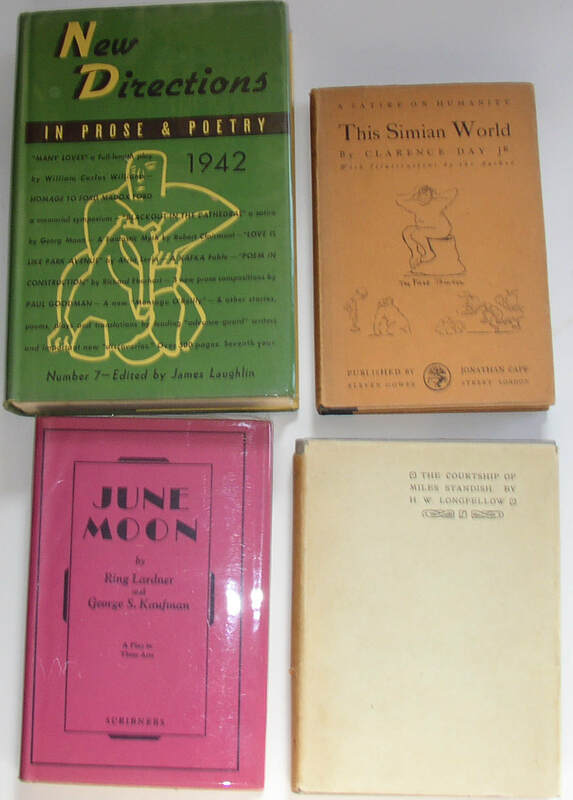 Including: Story (4 issues from 1934); The Hound & Horn (2 issues from 1930-32); Direction (1 issue from 1935); Contempo (1 issue from 1932, with Wallace Stevens poem); Paris Review (1 issue, 1955); Fantasy (2 issues from 1934 and 1941); IO (10 issues from the early 1970s); and single issues from each of the following: The Sixties (1968); Fuse (1972); Venture (1960); Blue Grass (1963; Zukofsky included); Notes from the Garage Door (1966; Allen Ginsberg included); Halcyon (1973, 2 copies). I count that up as 27 items, some of which are scarce. Condition: generally between about VG and Fine. 473. 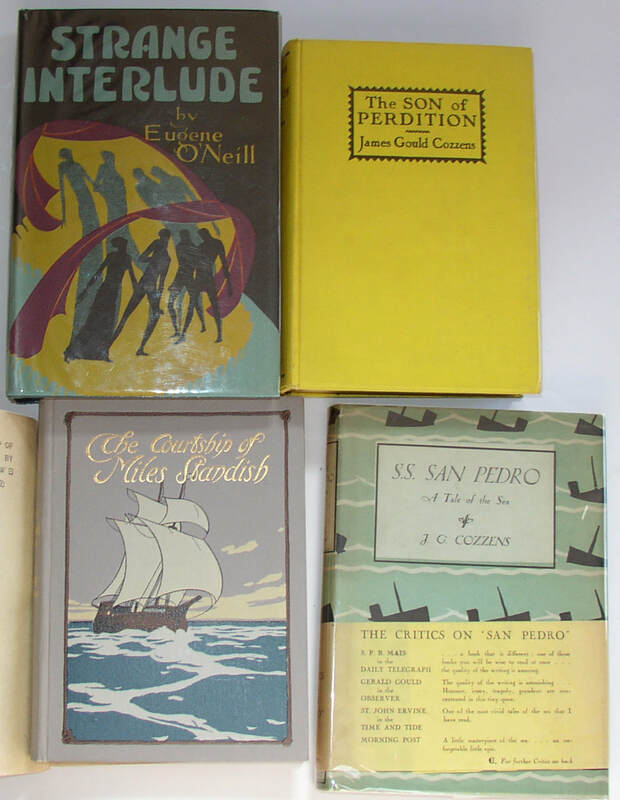 Four literary 1st editions in original dust jackets, plus one lacking jacket. 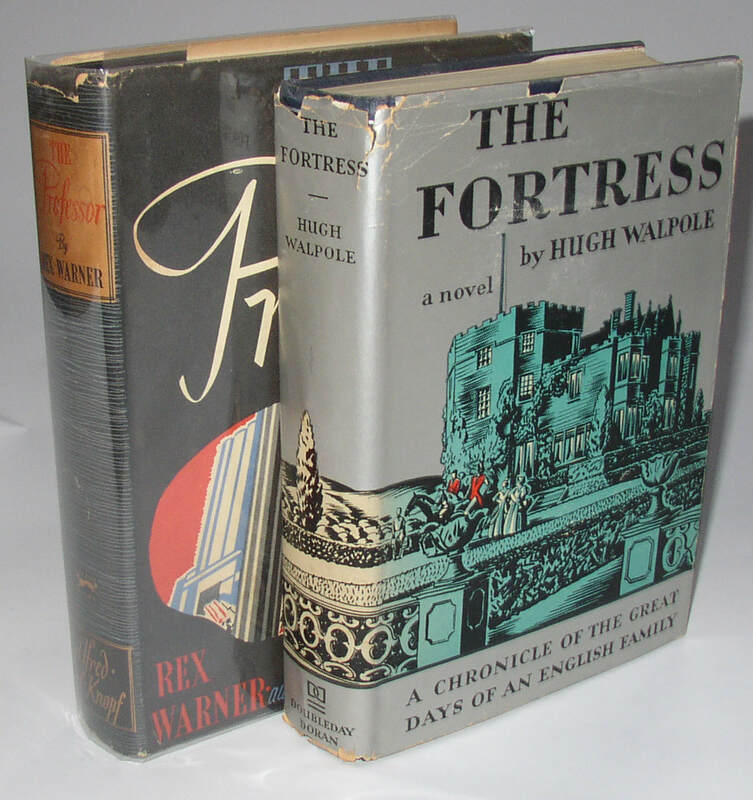 Includes: Hugh Walpole, The Fortress (New York, 1932) first in dj, some wear and chipping to dj, previous owner’s inscription; some waviness to a few pages, probably from storage, rather than damp. 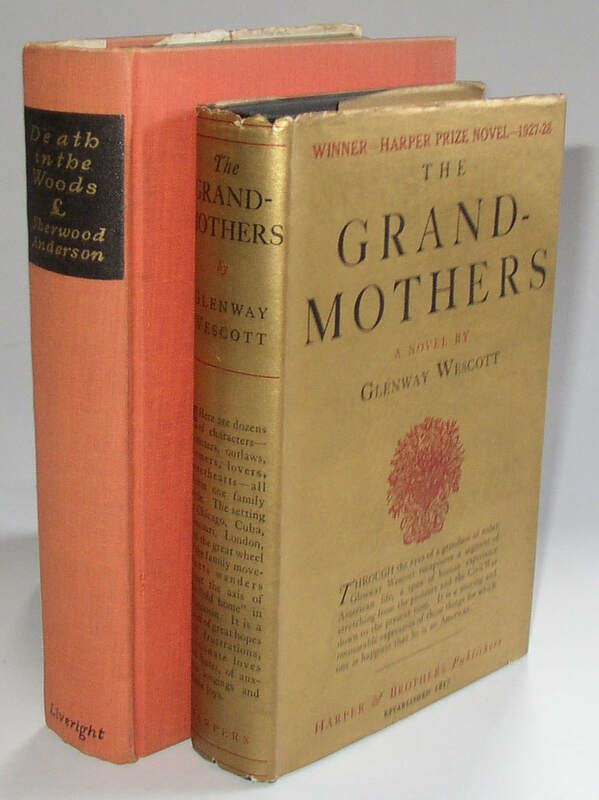 Also, Rex Warner, The Professor (New York, 1938), first, some chipping to jacket, near VG/VG; Also, Glenway Westcott, The Grandmothers (New York, 1927) First trade edition in dust jacket, with some minor wear, etc to edges of jacket: NF/VG. 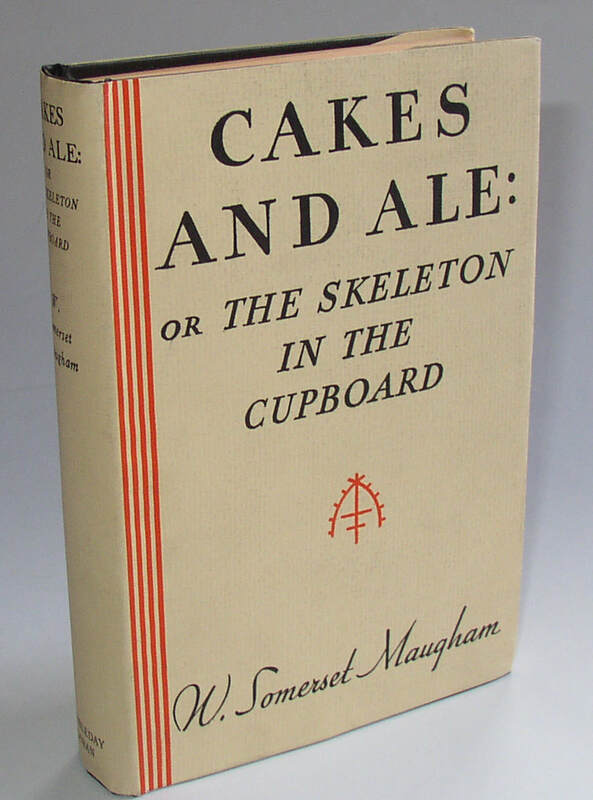 Also; W Somerset Maugham, Cakes and Ale (New York, 1930) About F/F: a beautiful clean copy. Also, Sherwood Anderson, Death in the Woods (New York, 1933); partial jacket laid in; about Near Fine. A nice lot. 475. 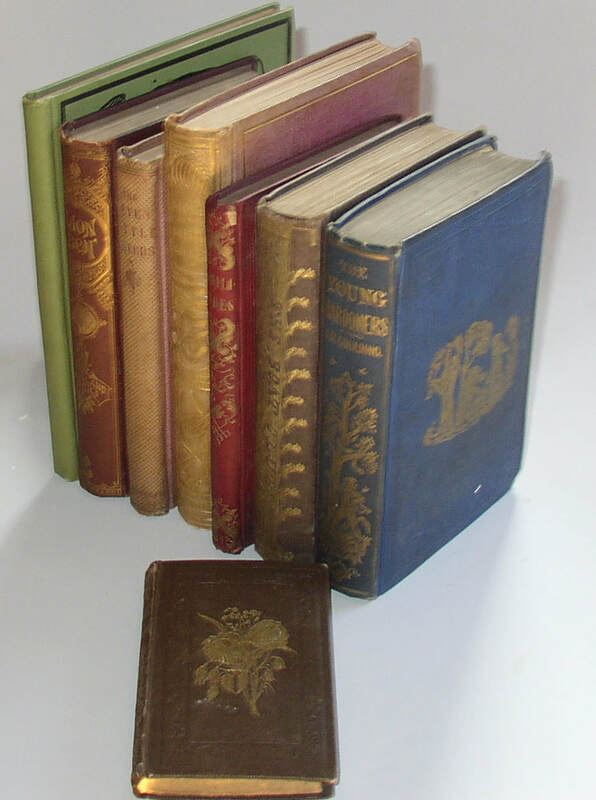 A small lot of American books (1816-1849) in original leather bindings. Includes: Calvin, Institutes of the Christian Religion (Philadelphia and New Haven, 1816); 3 volumes, translated by John Allen. About VG, but volume 1 lacks the front free end-paper. With: William Beloe, Herodotus, translated from the Greek (New York: Berreford, 1828), 3 volumes. Heavily worn, with significant loss to the leather on spine 1 and 2. 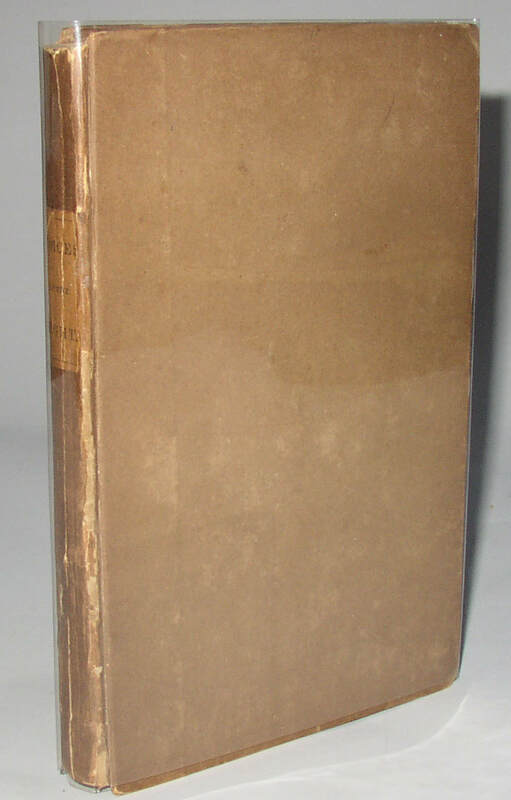 And: S W Cole, American Fruit Book (Boston, 1849); 1st edition; boards essentially both detached, with the free end-papers attached to the boards. And: Alexander Pope, An Essay on Man (Ithaca, NY, 1846). VG; quarter-leather binding. A mixed lot, with varying conditions. 476. 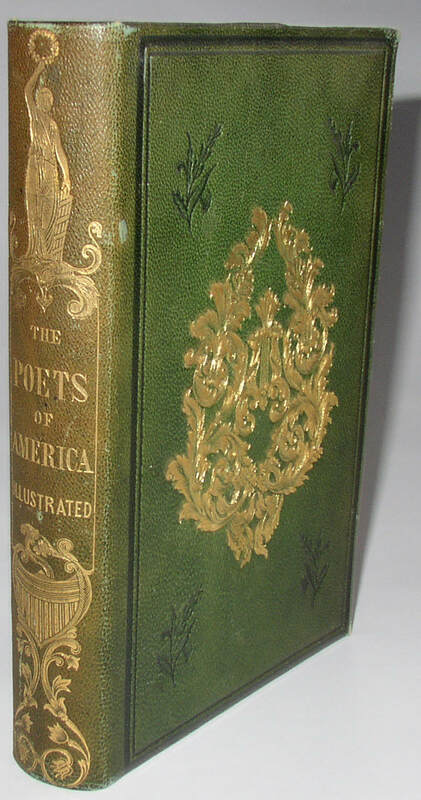 John Keese, ed., Poets of America Illustrated (1840), 1st edition in green leather gilded binding. New York: Colman, 1840. First edition, in what must be a deluxe binding: green leather with gilding to front board, spine, and rear board; all page edges gilded. Non-authorial gift inscription dated January 1, 1840. Includes Moore’s “A Visit from St Nicholas” along with many other familiar (and less familiar) items. Condition: VG, with some signs of wear to the leather, but still quite striking. Some fading to spine, some internal spotting. 477. 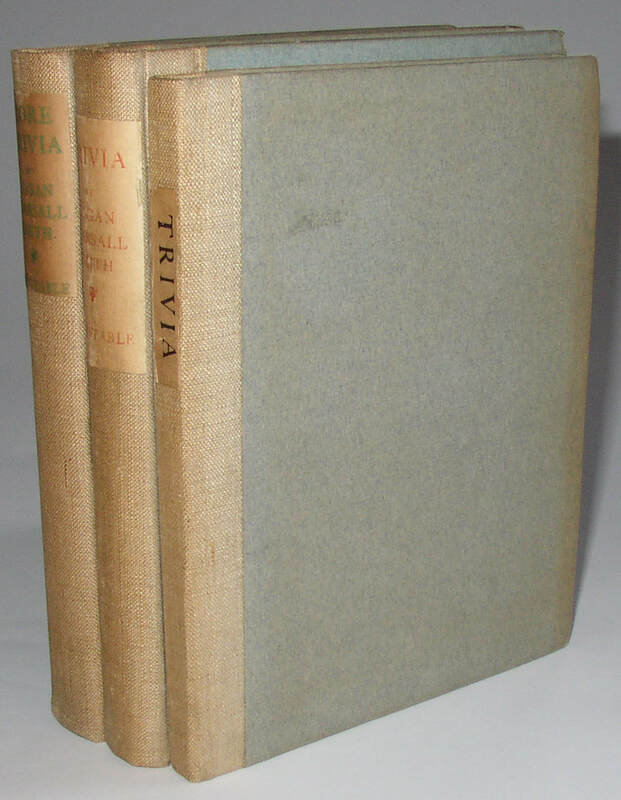 Logan Pearsall Smith, Trivia, Trivia, and More Trivia, 1st editions, 2 signed. London: Chiswick Press and Constable, 1902-1922. 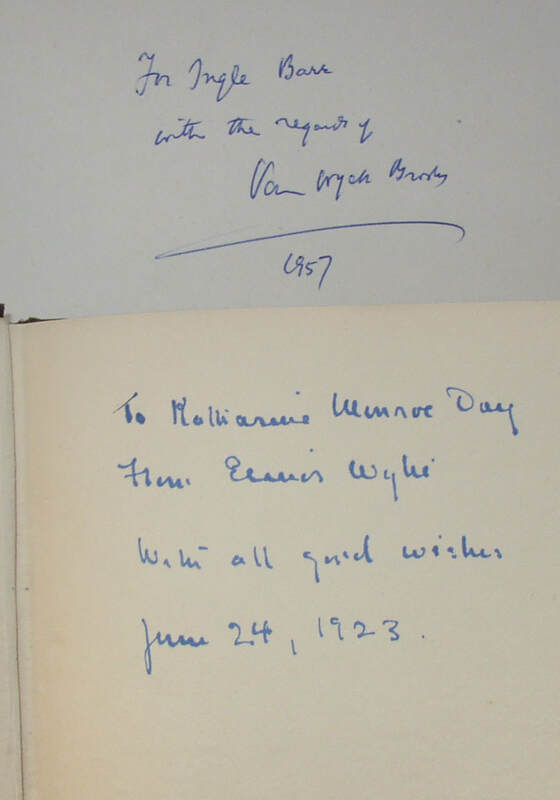 Trivia in both the privately printed first edition (1902) and the first UK trade edition (1922), both signed and inscribed by Smith; More Trivia (Constable 1922) also present, but not signed. 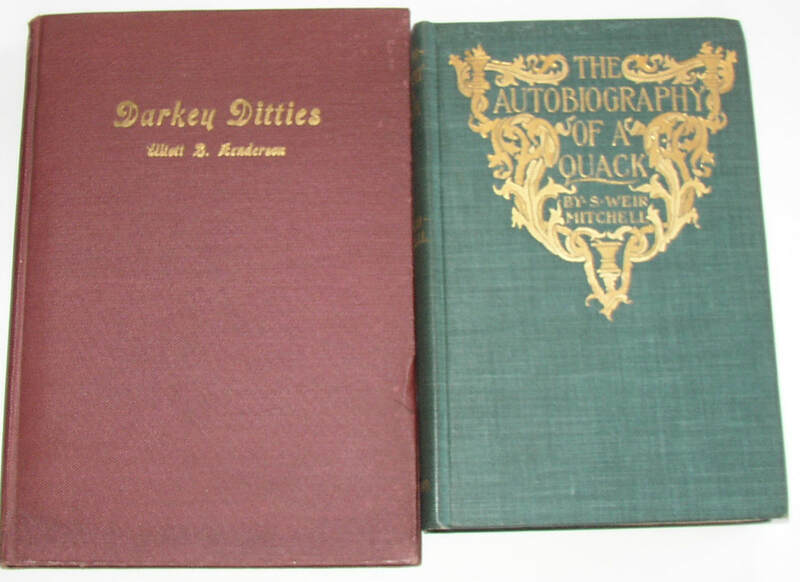 Condition: no dust jackets, two signed books with previous owner’s bookplate. VG overall, in a hard slipcase and stiff folding chemise. 478. 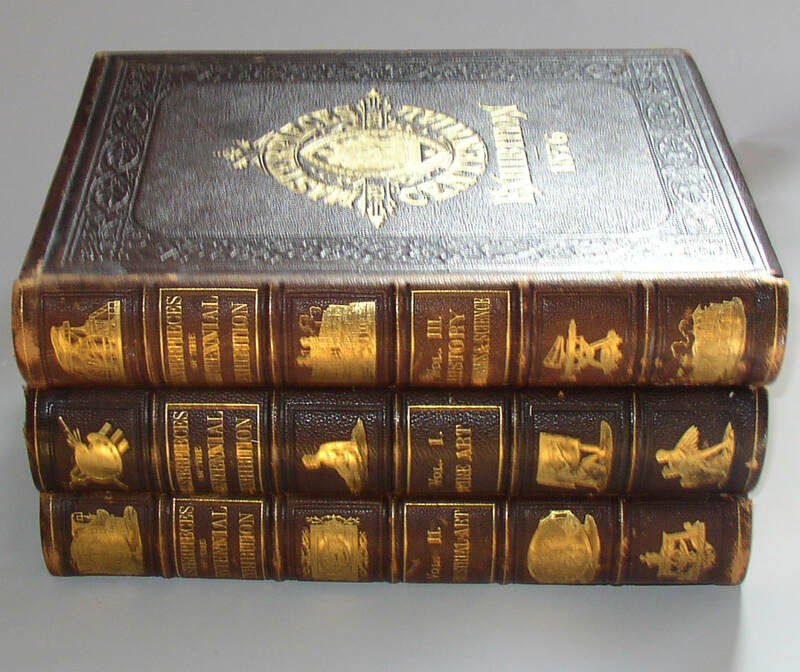 Group of mostly 19th-century books on historical subjects; most or all 1st editions. Includes: Rev. Henry Robinson, A Biographical Sketch of Rev. Mary Baker Eddy (scarce; in wraps; VG to NF). 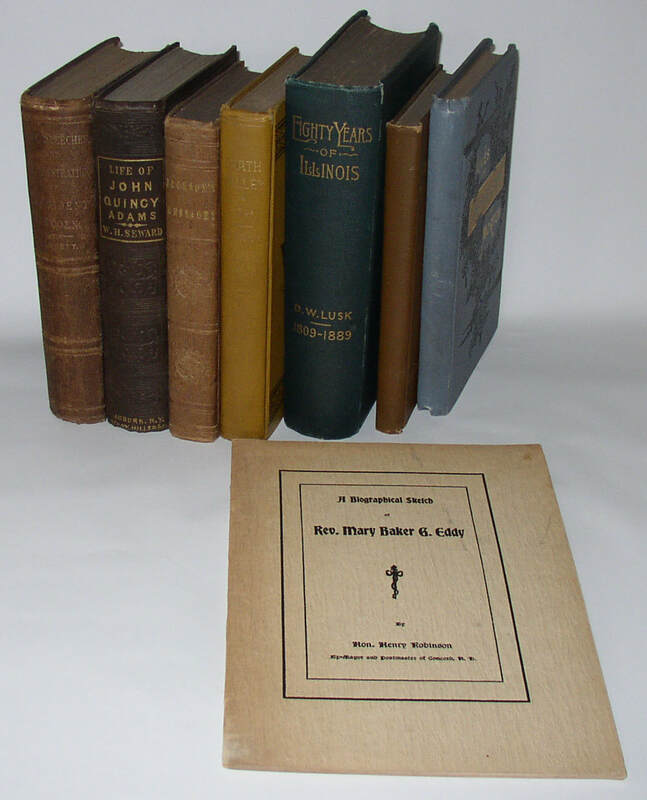 Also: Joseph H Barrett, Life of Abraham Lincoln (Cincinnati, 1864; before the assassination; scarce edition: G to VG); Also William H Seward, Life and Public Services of John Quincy Adams (1849; VG); Also [Lew Wallace] Lives of Harrison and Morton (1888; early state of the salesmen’s dummy, with sample text—not by Wallace, but promising Wallace text to come); VG to NF); Also Andrew Jackson, Messages to the United States’ Congress (Cincinnati, 1837; VG+); William Lewis Manly, Death Valley in ’49 (San Jose, 1894; VG); Also J M D Burrows, Fifty Years in Iowa (Davenport, 1888; VG to NF); Also D W Lusk, Eighty Years of Illinois Politics and Politicians, Anecdotes and Incidents (Springfield 1889; VG). Much of interest here. 479. 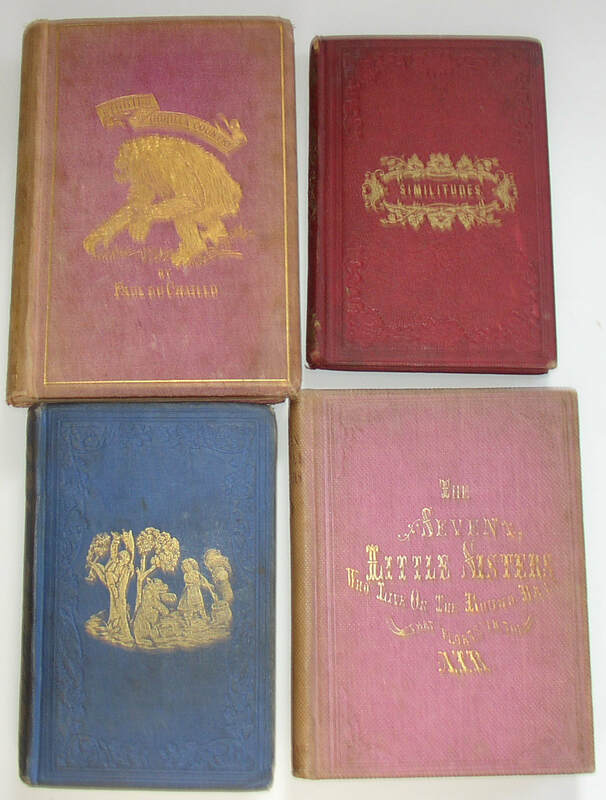 Group of five books of children’s literature, mostly 1st edition, 1888-1916. Including: A) William Allen White, The Court of Boyville (Doubleday & McClure, 1899; NF); B)Marshall Saunders, Beautiful Joe (Philadelphia: Charles H Banes, [ca. 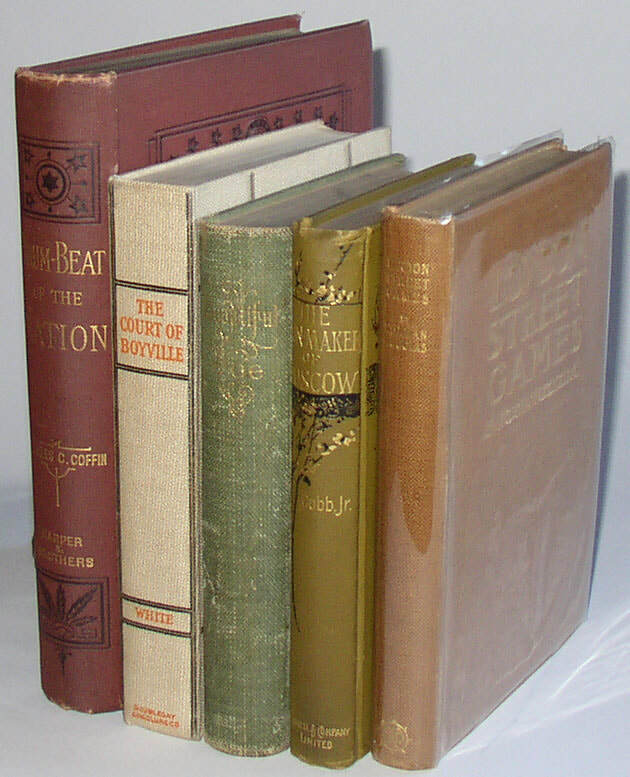 1893] and thus apparently not a first; near VG); C) Sylvanus Cobb, Jr., The Gun-Maker of Moscow (Cassell, 1888; droplet spot on front cover; minor stains on paste-downs, about VG); D) Norman Douglas, London Street Games (London, St Catherine Press, 1916; mild corner bumps, NF); E) Charles C Coffin, Drum-Beat of the Nation (Harper, 1888; old non-authorial gift inscription; else NF). Four collectible firsts, then, I believe. A nice set. 480. 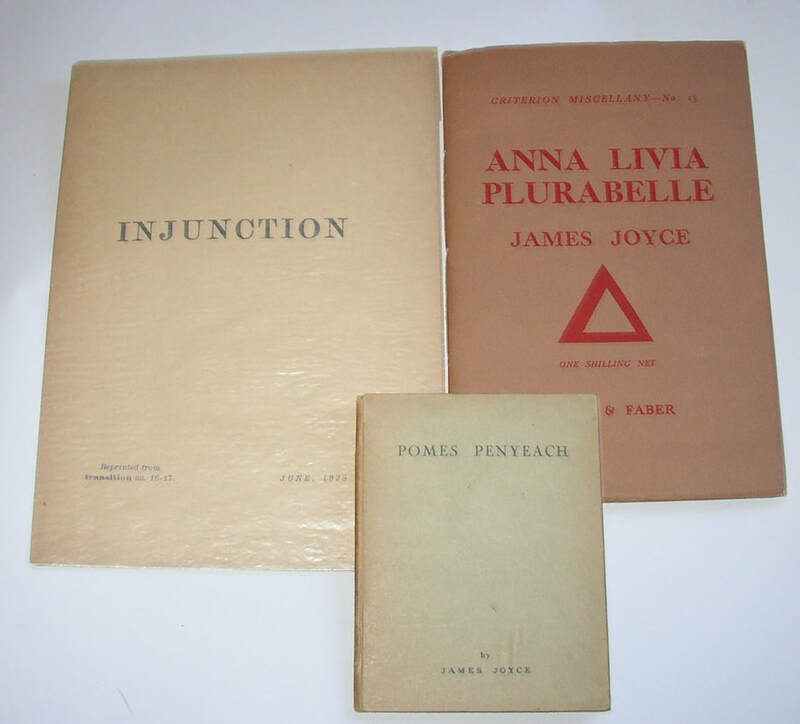 James Joyce; a variety of items, including 1st edition of Pomes Penyeach (1927). 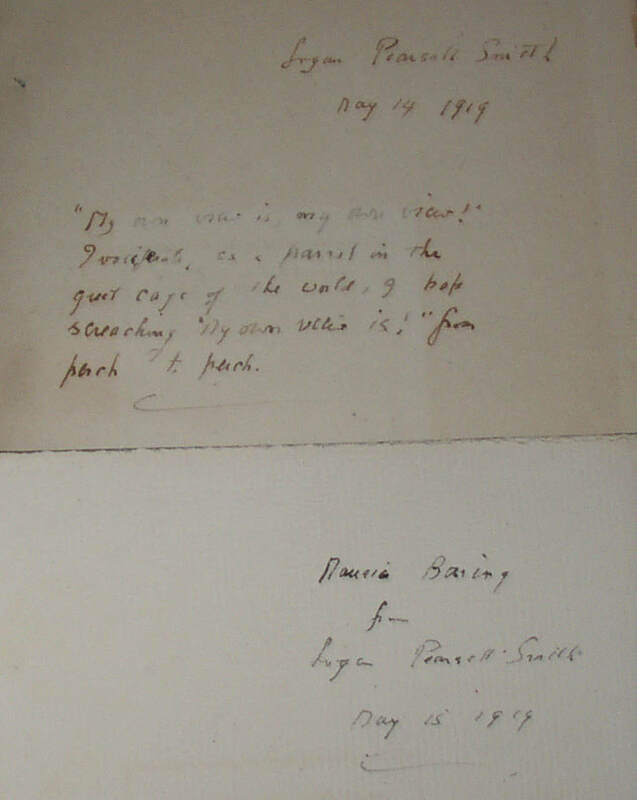 Pomes Penyeach (Paris: Shakespeare & Co, 1927); errata slip present. Near VG, with minor wear to the spine area: better than many copies. 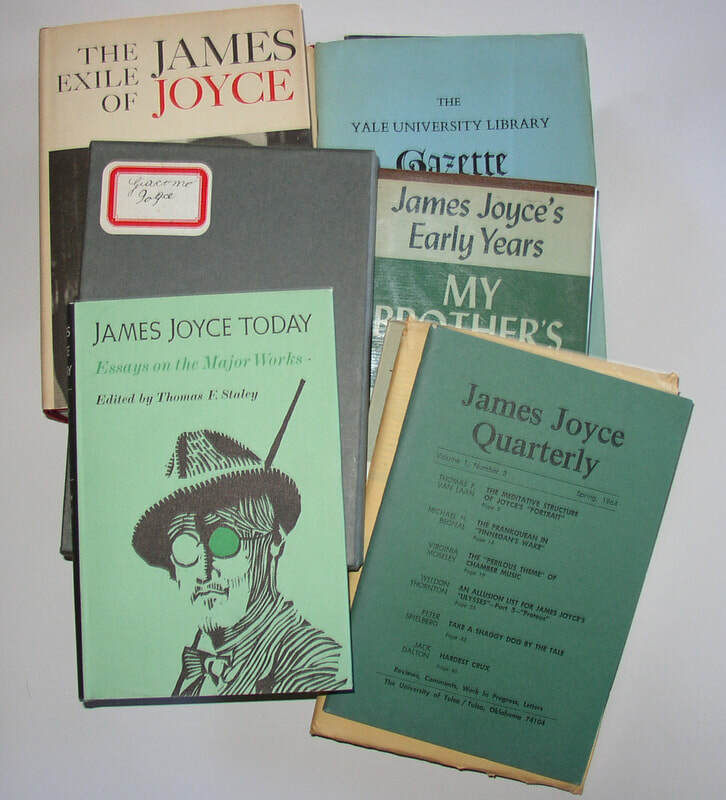 Color is browned almost overcoming the green; there is one area of surface bubbling on the front cover, seemingly from the manufacture, right above the name “Joyce.” Also: “Injunction”, reprinted from Transition no. 16-17 (June 1929); 2 leaves; a very scarce and fragile item; in (original?) glassine (NF). Also: Anna Livia Plurabelle (Faber 1st printing, in sewn-on jacket; unopened and NF/NF or nearly so: very sharp. 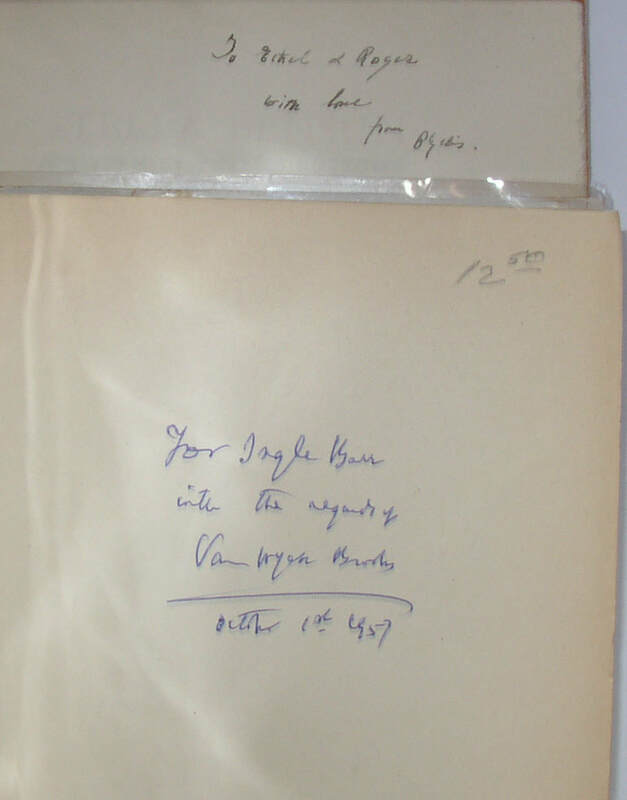 With three ephemeral items laid in, offering The Criterion; Stuart Gilbert’s study of Ulysses; and Joyce’s recording of 4 pages from Anna Livia Plurabelle: all in all a very nice example of this Joyce trade edition. With Giacomo Joyce (1st ed. in slipcase); with two issues of James Joyce Quarterly (1964 and 1965); with an issue of Yale University Library Quarterly and an issue of Inventario, the latter with Joyce content; with Thomas Staley, ed, James Joyce Today (1966); and with Helene Cixous, The Exile of James Joyce (1972); and with Stanislaus Joyce, My Brother’s Keeper (1958) w/ bookplate and old jacket cover. A nice little collection. Condition: Most items near NF, although Pomes Penyeach is probably only VG. 481. 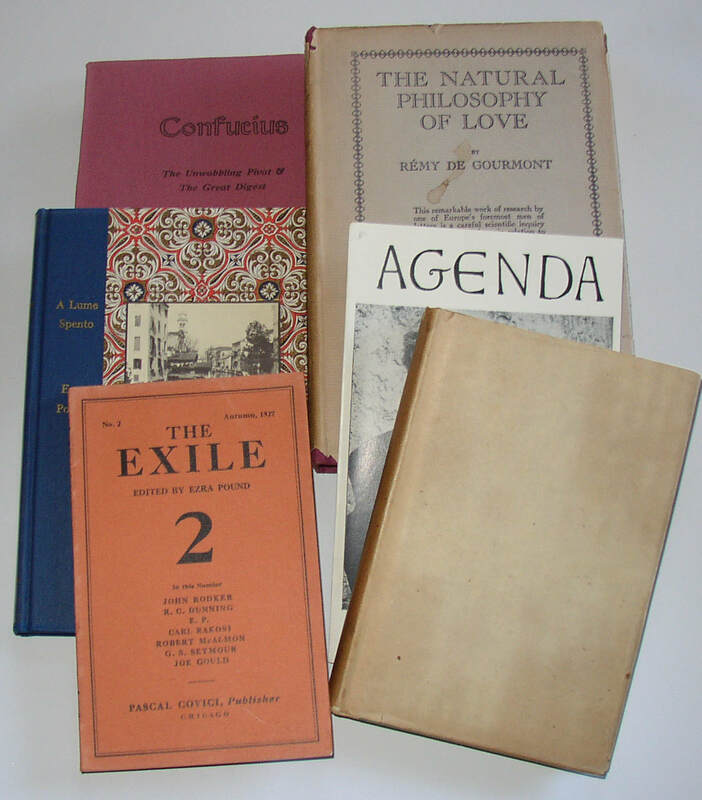 Botteghe Oscure and City Lights Journal: six issues of two influential mid-century literary journals. Includes: Botteghe Oscure, issues 1, 12, 24, and 25 (1949-1960); and City Lights Journal numbers 1 and 2. 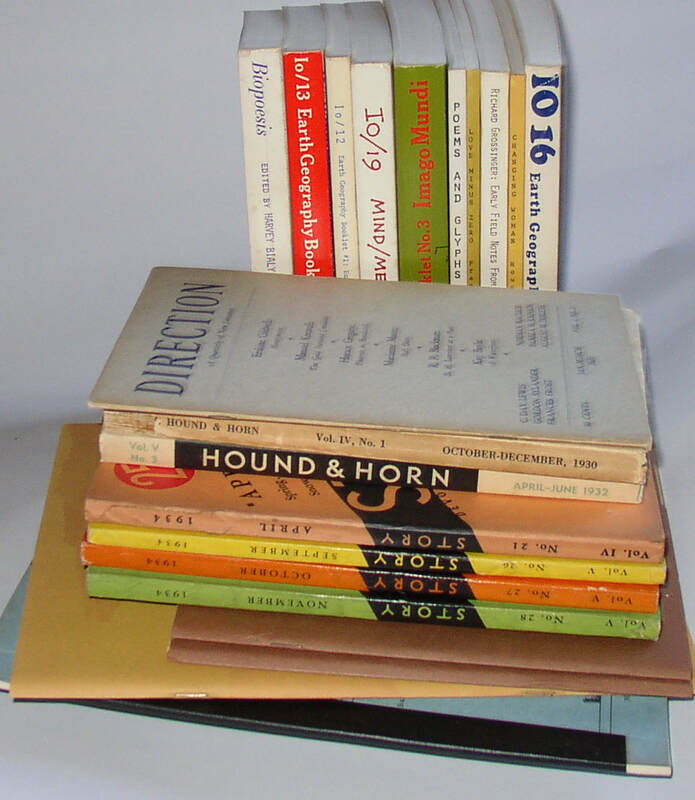 Important literary journals, including the scarce number one of each publication. 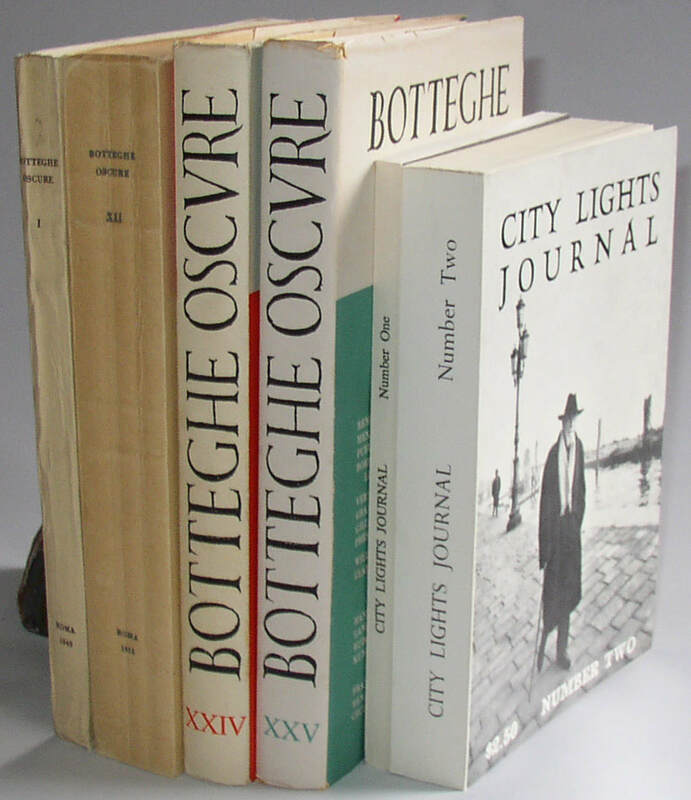 Condition: Botteghe, usually VG or better; City Lights Journal: both issues Fine. 482. 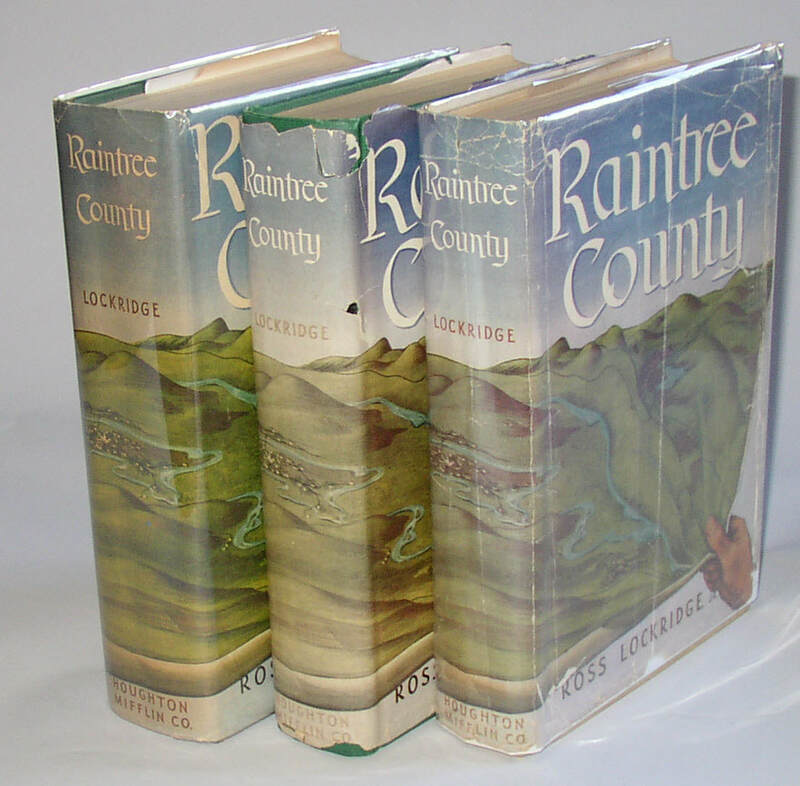 Ross Lockridge, Raintree County, 3 copies, including a signed first edition. Condition: Both first editions have jackets with heavy wear and chipping; the signed copy has some staining on the rear cover, including a drink ring. 483. 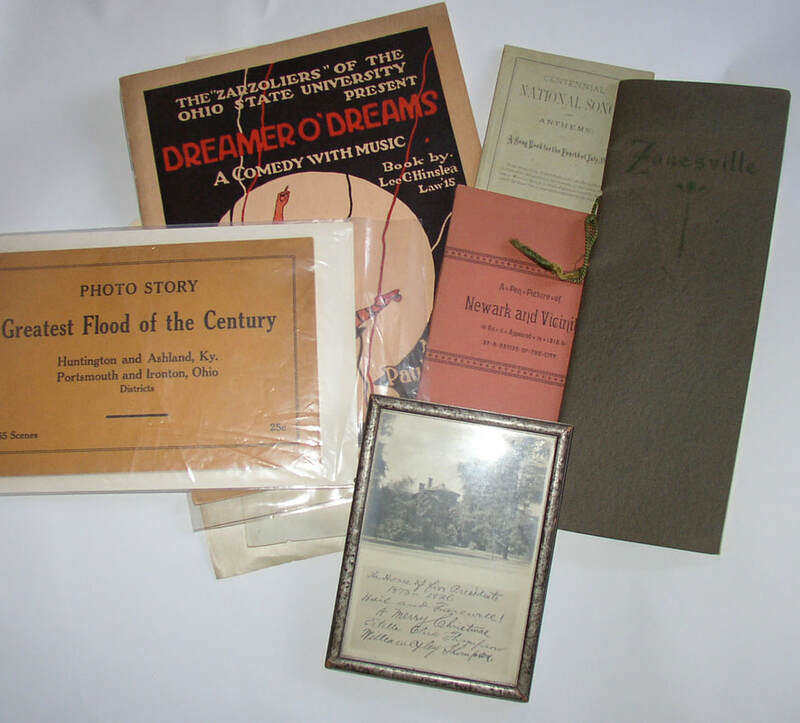 Large lot of Ohio books, books by Ohio authors, and ephemeral Ohioana items. 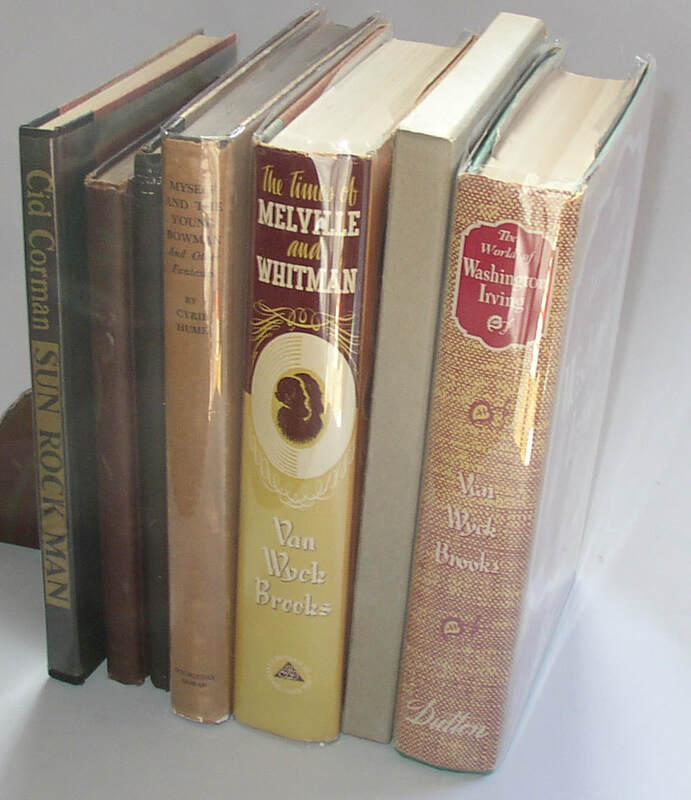 Includes 10 hardcover books, mostly or all first editions: including, Alice Reese, Hurrah for American: A Tale of Welsh Life (Dayton, 1898); John Arbuckle, Marching with Sherman (Columbus, 1930); and Edmund Hatcher, The last Four Weeks of the War (Columbus, 1892); Also, at least thirty softcover books, with some highlights being: Photo Story Greatest Flood of the Century Huntington and Ashland Ky., Portsmouth and Ironton, Ohio; Joseph Williamson, The Soul of a Pioneer (Rushville, 1924); The ‘Zarzoliers’ of the Ohio State University Present Dreamer O’Dreams (1916); Zanesville (1911; with Howard Chandler Christy Illustration, “The Girl from Zanesville”); A Pen-Picture of Newark and Vicinity as it appeared in 1818 (Columbus, 1887); Wm, P. Moone, Centennial National Songs and Anthems (Gahanna, 1876; 70% of rear wrap torn away). Plus various letters, ephemeral items, etc, including several Ohio State items from ca. 1910-1915, including a photograph of the president’s house at OSU, signed and inscribed by Ohio State President William Oxley Thompson in 1926. Several of these items are notably scarce. Condition: Various, but generally VG to Fine. 484. 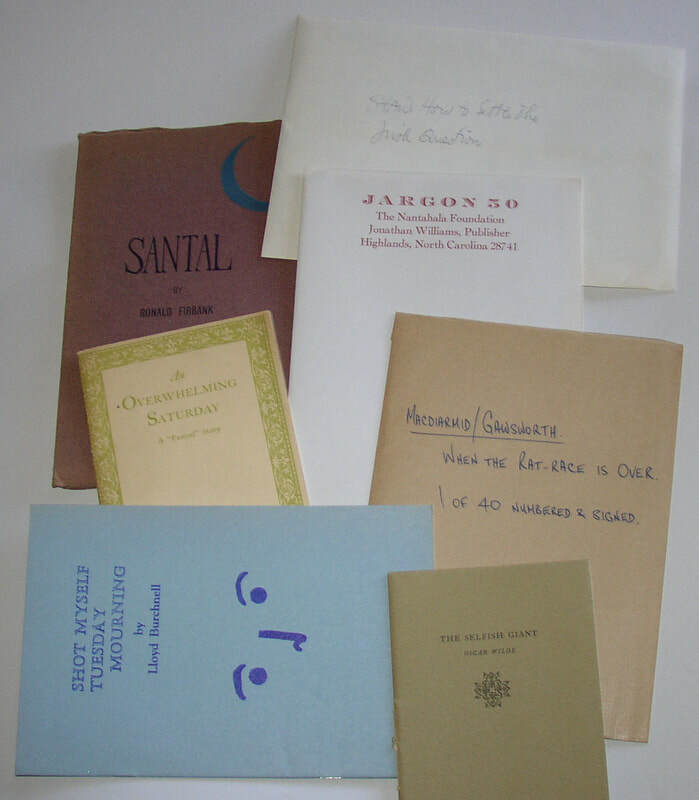 Varied lot of poetry chapbooks and other slim items of various sorts. Around forty items, often interesting, but generally all very small or ephemeral, and of varying levels of interest; Too numerous to list all these items, but they include the following. 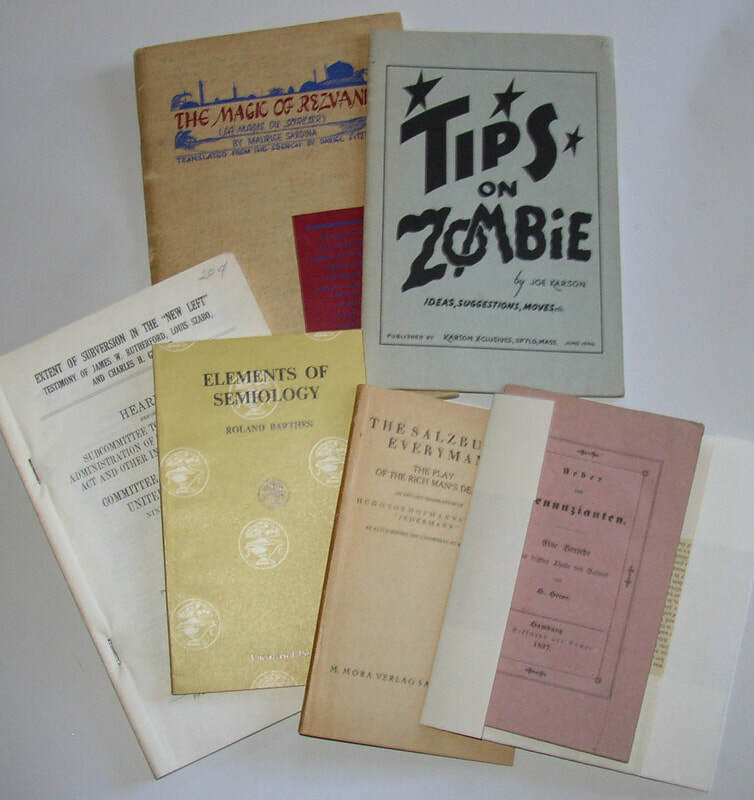 2 items on Magic: Tips on Zombie I1946) and The Magic of Rezvani (1949); Small or regional press items: For Christmas MDCCCCVIII (New Poems; printed by the Women’s Printing Society); Lucia Chase Bell, Obil Keeper of Camels (San Francisco: Paul Elder, 1910); Wallace Irwin, The Rubaiyat of Omar Khayyam Junior (San Francisco, Elder & Shepard, 1902). 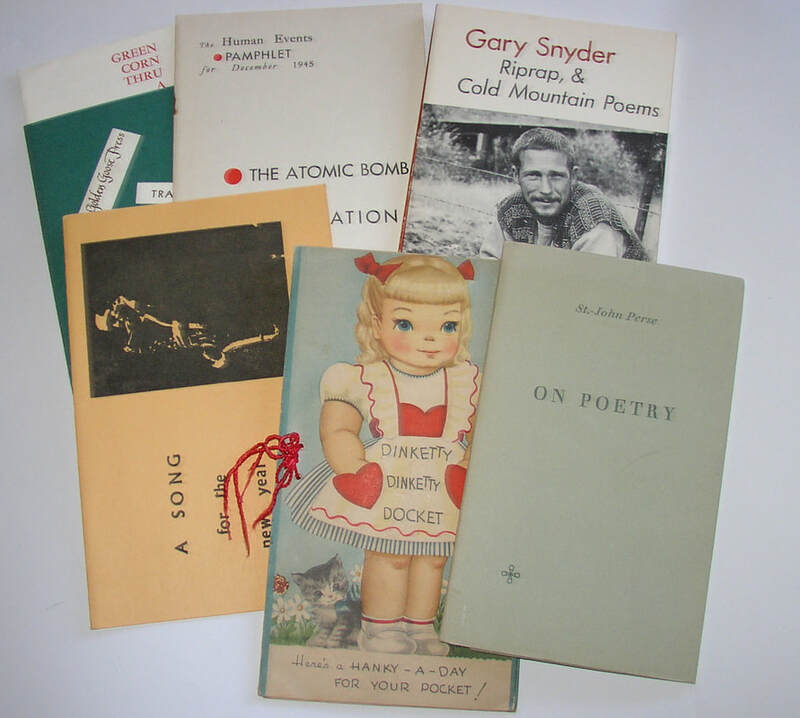 Poetry and Literature: Gary Snyder, Three Worlds, Three Realms, Six Roads (1st ed); Robert Frost, The Lone Striker, in original mailing envelope; Hart Crane Seven Lyrics (1966, one of 250 copies); Robert Creeley, The Finger; MacDiarmid/Gawsworth, When the Rat-Race is Over, 1 of 40 copies signed; George Bernard Shaw, How to Settle the Irish Question; Prospectus in envelope for Jargon 50; Booth Tarkington, “An Overwhelming Saturday”; St-John Perse, On Poetry (translated by Auden); Ronald Firbank, Santal (1st ed, 1921). Various other items as well, some perhaps as good as these I’ve noted, some perhaps not. An interesting lot, overall. Condition: Mostly VG or better. 485. 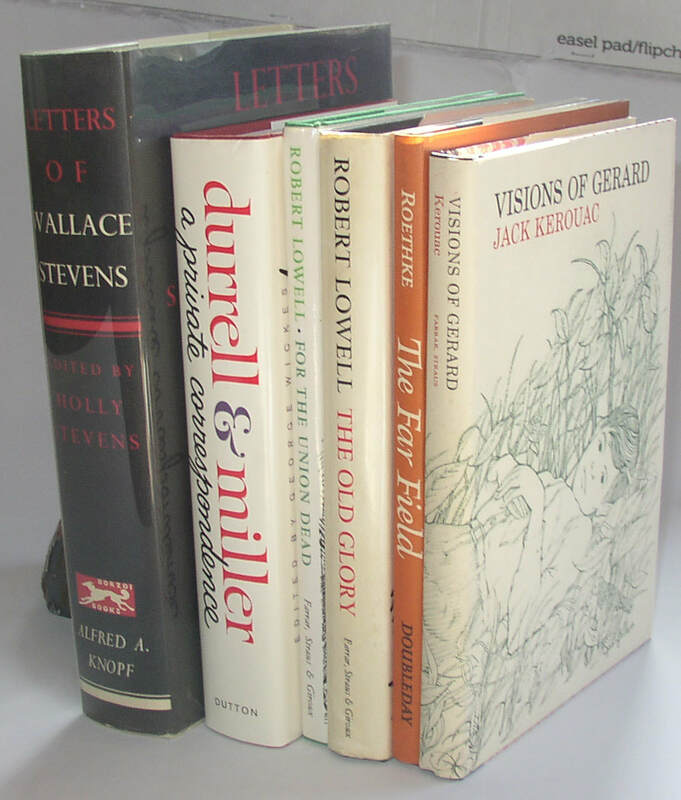 Ezra Pound, a small lot of 6 items, all first editions or 1st printings. 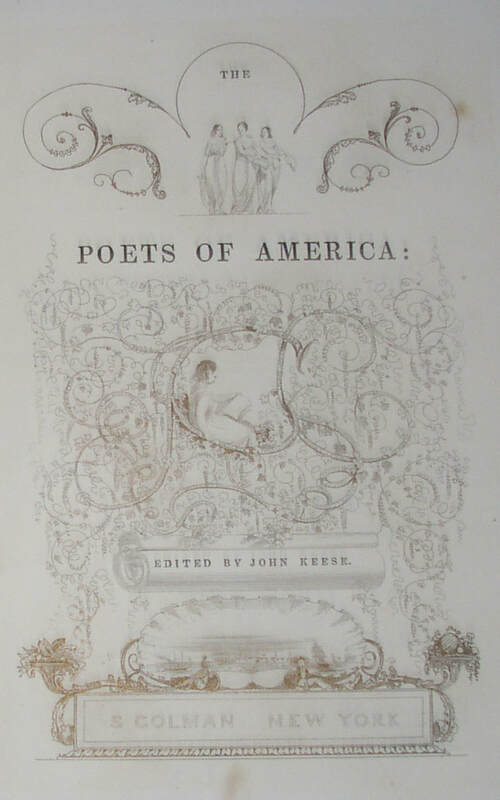 Includes: A) The Newark Anniversary Poems (New York, 1917); first edition in original unprinted plain paper dust jacket; Pound’s contribution at pp. 100-102. B) Remy de Gourmont, The Natural Philosophy of Love, translated and with a postscript by Ezra Pound (New York: Rarity Press, 1931); first edition in dust jacket; VG/G; some chipping and staining on jacket. C) A Lume Spento (New Directions, 1965); first printing. About Fine in somewhat shrunken acetate jacket. D) The Exile 2, edited by Pound (1927); VG, with a couple bends on front cover. E) Confucius, The Unwobbling Pivot & the Great Digest, trans. By Ezra Pound (Pharos 4, 1947) NF. F) Agenda vol 4 no.2 : Special Issue in Honour of Ezra Pound’s Eightieth Birthday. VG to NF. 486. 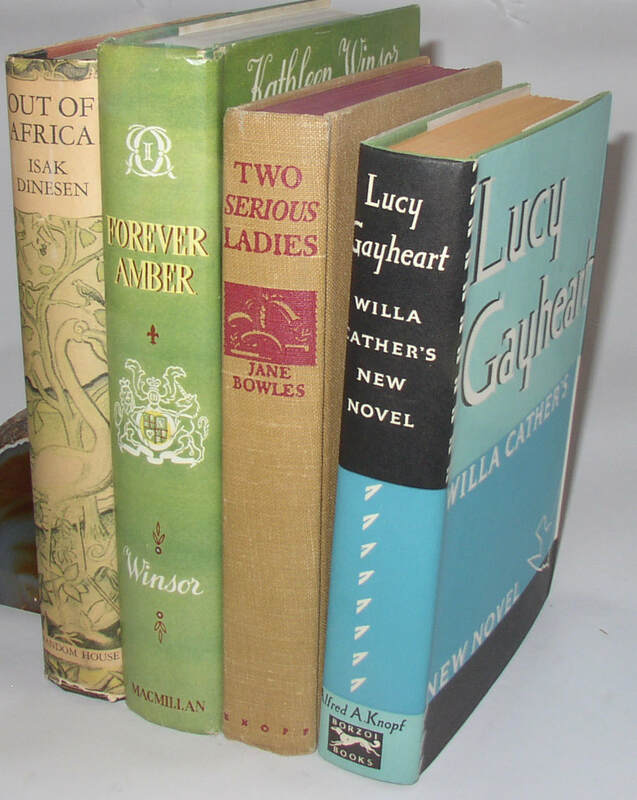 Four 1st editions (1935-43) 3 in dust jackets; 1 without: Dinesen, Cather, Winsor, Bowles. 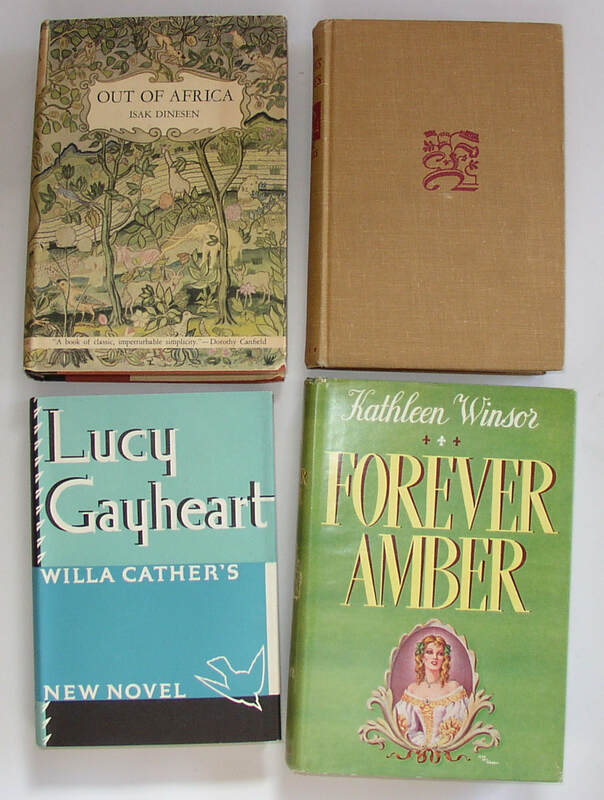 Willa Cather, Lucy Gayheart (Knopf, 1935) 1st edition in dust jacket; Isak Dinesen, Out of Africa (Random House, 1938); 1st edition in dust jacket; Kathleen Winsor, Forever Amber (Macmillan, 1944) first edition in dust jacket; Jane Bowles, Two Serious Ladies (Knopf, 1943), 1st edition, lacking jacket. 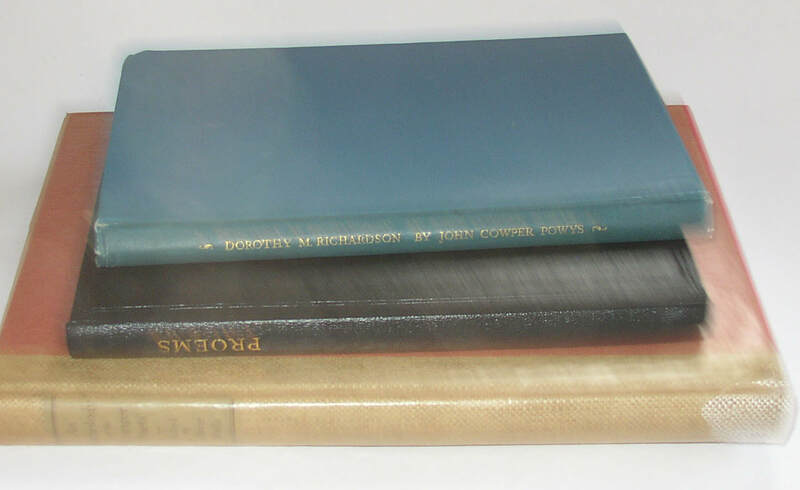 Condition: Cather close to F/F; Dinesen, with some chipping to base of spine jacket (VG/VG); Winsor, chipping/bumping at spine ends, VG/VG; Bowles, VG or nearly so. 487. 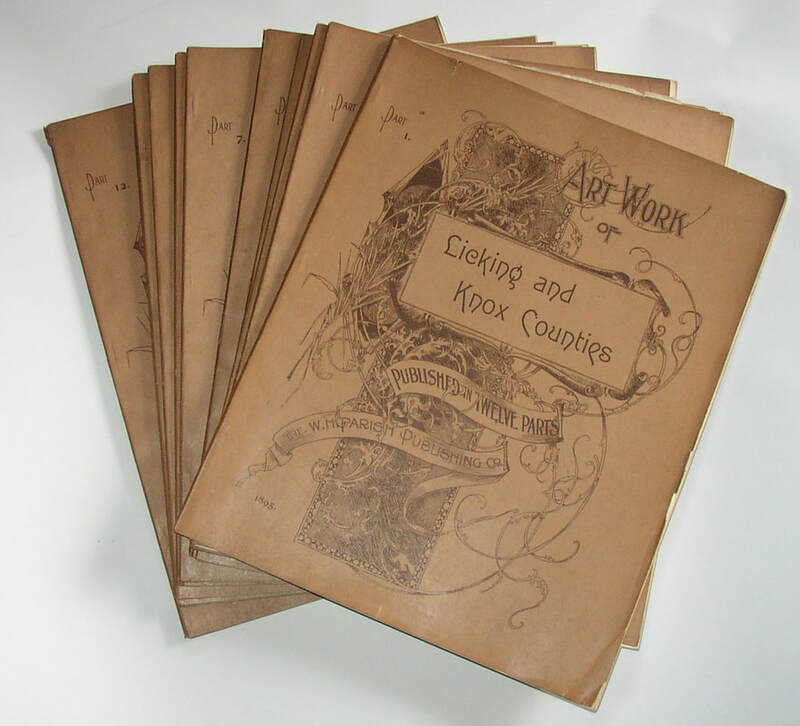 Scarce Art Work of Licking and Knox Counties [Ohio], 1895, 12 volumes. W. H. Parish, 1895. Twelve parts, all of which are present, in printed brown wraps. Some text, but mostly or entirely a series of photographs of rural scenes and in-town buildings (both businesses and residences) in these two central Ohio counties. An invaluable photographic reference work for the area, and quite scarce. OCLC seems to turn up only four copies total. Condition: some, mostly minor wear at the edges and on the wraps: VG or better as a rule. 488. 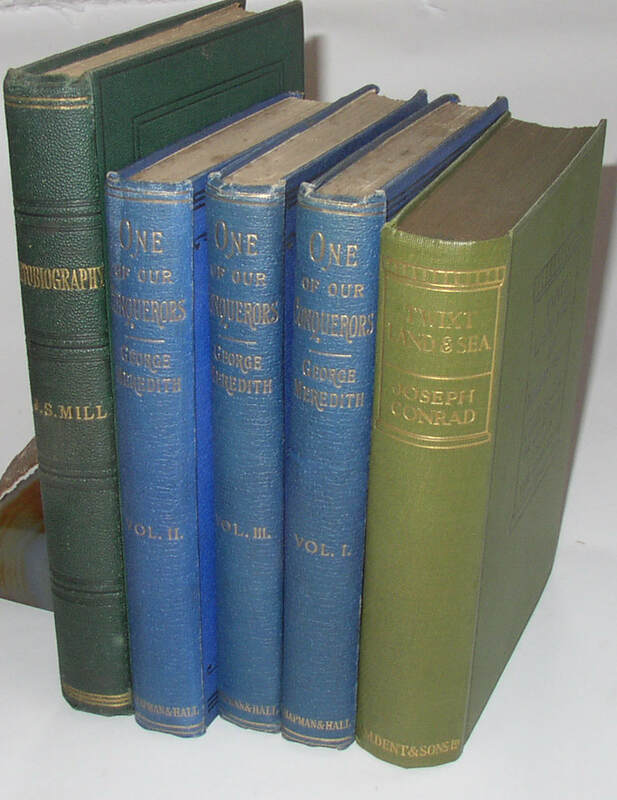 Lot of literary first editions, 1862-1912: Tennyson, Conrad, Mill, Du Maurier, etc. 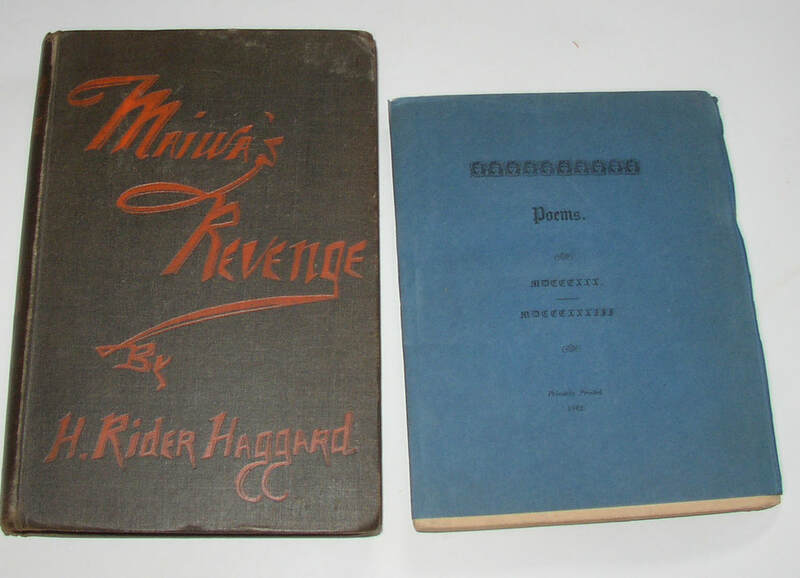 Includes: Tennyson, Poems MDCCCXXX-MDCCCXXXIII (Privately printed 1862)—a pirated edition (VG; uncut in wrappers); John Stuart Mill, Autobiography (1874); first edition, VG with early owner’s name twice; H Rider Haggard, Maiwa’s Revenge (black cloth printed in red, 1888), about G-VG; George Meredith, One of Our Conquerors, (1891; three volumes, in blue cloth; possible later state, with list of authors works opposite title age); Du Maurier, Peter Ibbotsen (1892, uncut, in protective box); Paul Leicester Ford, The Honorable Peter Sterling (1894, close to NF, in protective case, though box has water damage, not affecting book); Joseph Conrad, Twixt Land and Sea (London, 1912, with corrected text on front board, and mild spine roll: VG). 489. 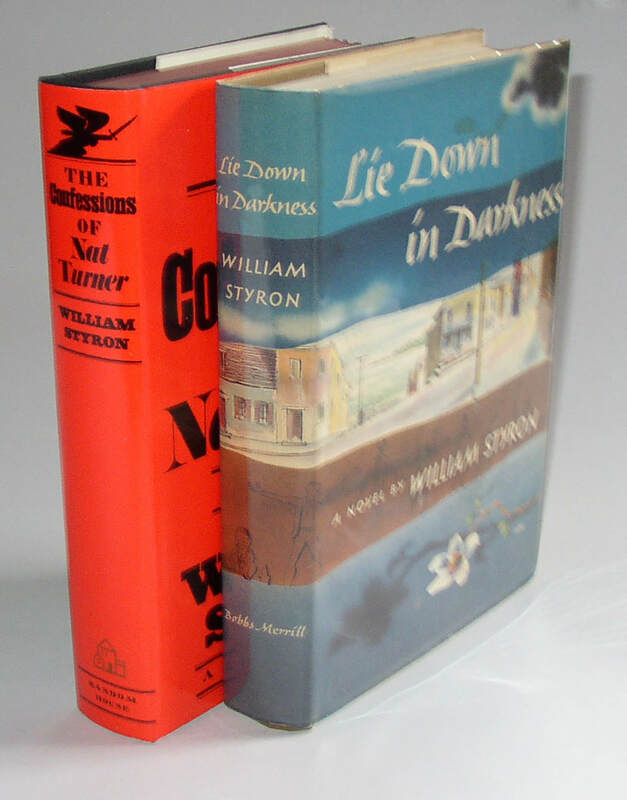 William Styron, Lie Down in Darkness, 1st ed, and Nat Turner, signed 1st ed. Lie Down in Darkness (Indianapolis: Bobbs Merrill, 1951); first edition in dust jacket. Confessions of Nat Turner (New York: Random House, 1967); signed and inscribed on the front free end-paper and dated in 1967. 490. 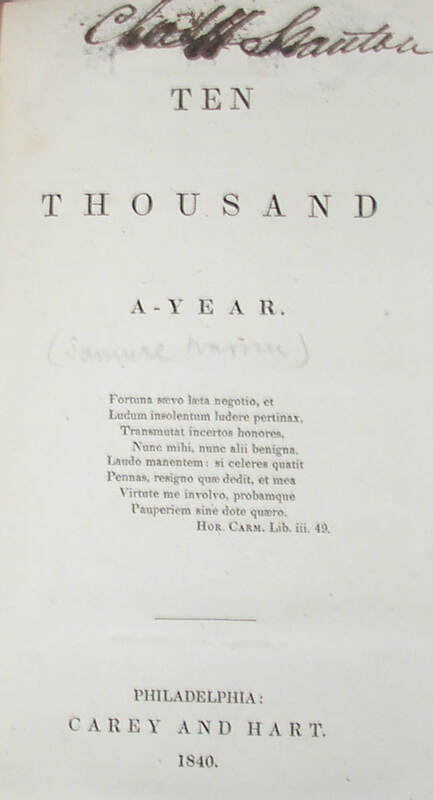 [Samuel Warren], Ten Thousand A Year, 1st edition in 6 volumes, 1840. Philadelphia: Carey and Hart, 1840. 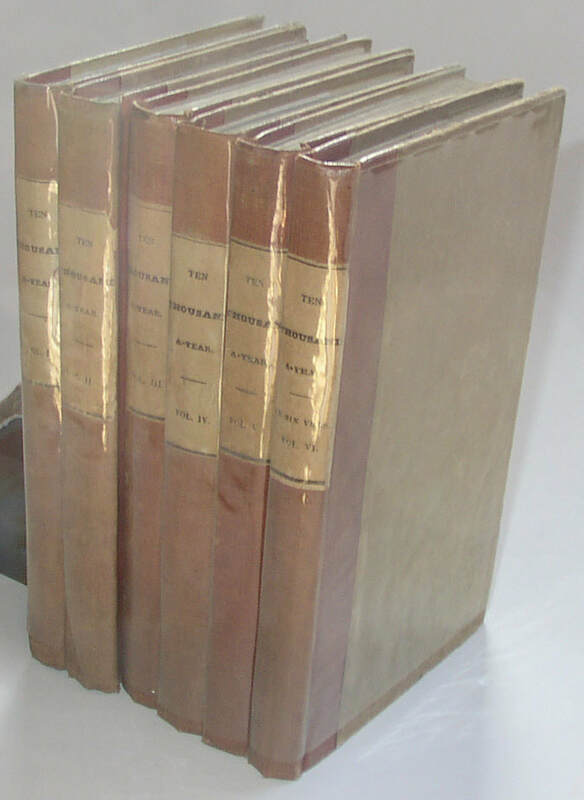 6 volumes; vols 1-4 with 1840 on the title pages; vols. 5-6, with 1841 on the title pages. Volume 4 has a four-page publisher’s add dated 1841 before the title. Spine labels almost entirely intact; a long pencil note by a previous seller in vol. 1 suggests “This I believe to be the finest copy known.” A very collectible copy. Includes: Solzhenitsyn, One Day in the Life of Ivan Denisovich (1st UK Edition); Wagner, The Poems of William Carlos Williams; Durrell, Clea (1st UK edition); Durrell & Miller, A Private Correspondence; Lowell, The Old Gory; Lowell, For The Union Dead; Roethke, The Far Field; Salinger; Raise High the Roofbeam Carpenters (with dedication page); Fowles, The Collector; Coover, The Public Burning; The Letters of Wallace Stevens; Kerouac, Visions of Gerard. Condition: Solzhenitsyn, about VG/VG; Salinger, with a nick to the top of the jacket spine; else close to F/F. A collectible lot. ; all first printings. Includes: Maurice Thompson, The Witchery of Archery (1878; first edition); some visible water marks to the first 30 pages or so: Good. 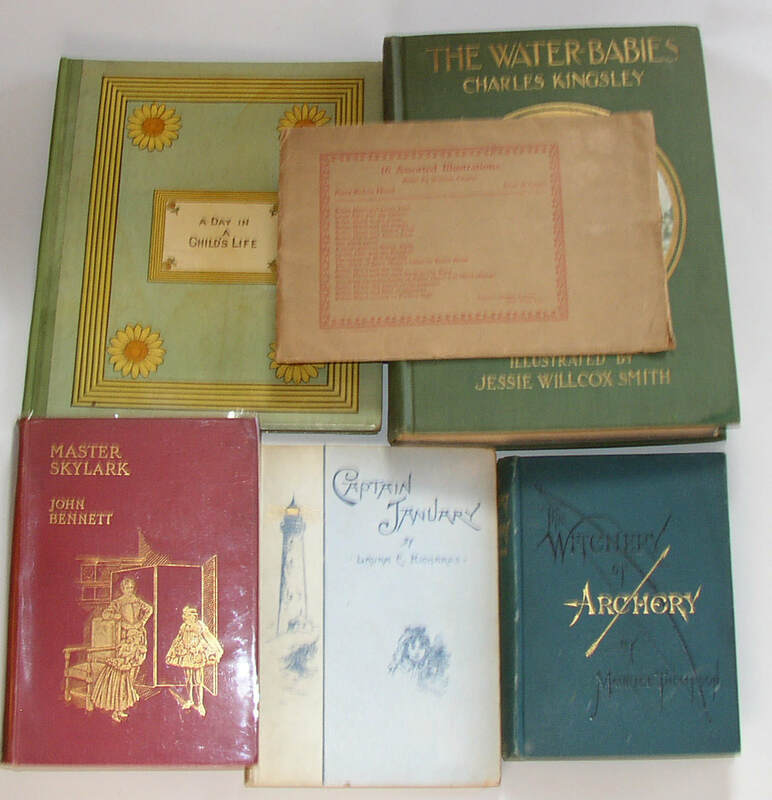 Also: Laura Richards, Captain January (Boston, 1891), VG; Also, John Bennett, Master Skylark, 1st edition copy in red cloth (1897); NF; Kate Greenaway, A Day in a Child’s Life (George Routledge, ) 1st ed, VG; Kinglsey, The Water-Babies, illustrated by Jessie Wilcox Smith (1927 gift inscription), VG no dj; 16 Assorted Illustrationss by Walter Crane for Robin Hood; in original (unused) mailing envelope (Thomas Nelson, ca. 1930s). 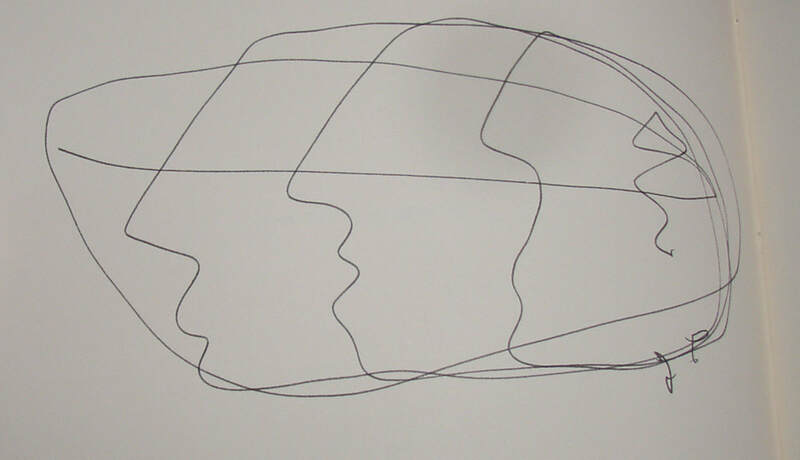 Envelope with some damage; one or two images with a bend. 493. Masterpieces of the Centennial International Exhibition (1876); 3 volumes. Undated, but presumably 1876. 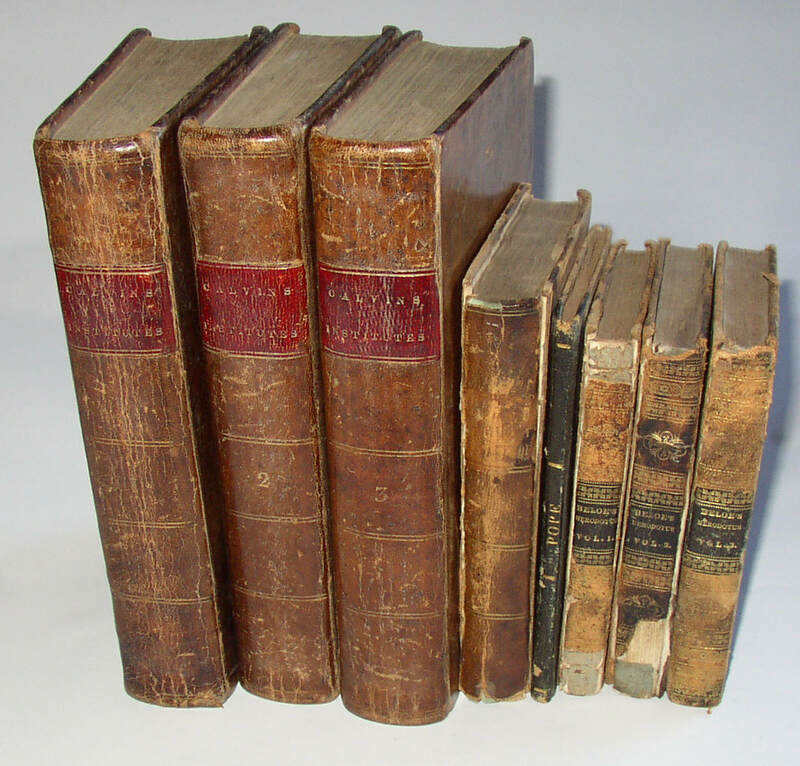 A beautiful set in original highly decorative brown leather bindings, which show some signs of wear around the edges. A nice set. Condition: VG, with some wear/scuffing to the leather. Interior is sharp, and the hinges seem in good shape. 494. 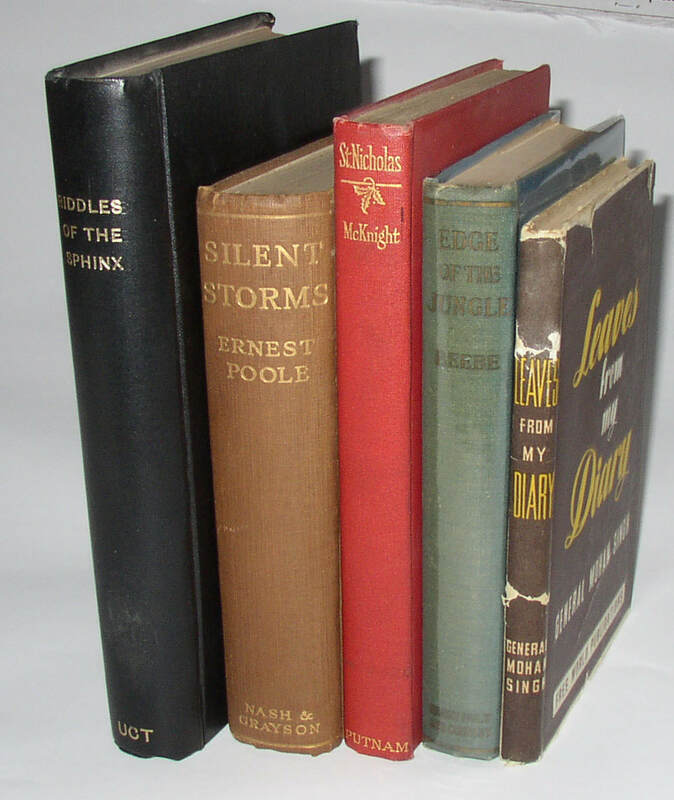 Literary 1st editions (mostly) all but one in dust jackets: c. 1920-1942. Includes: Clarence Day, This Simian World (London: Jonathan Cape, , near VG/VG, w/ bookplate, etc. 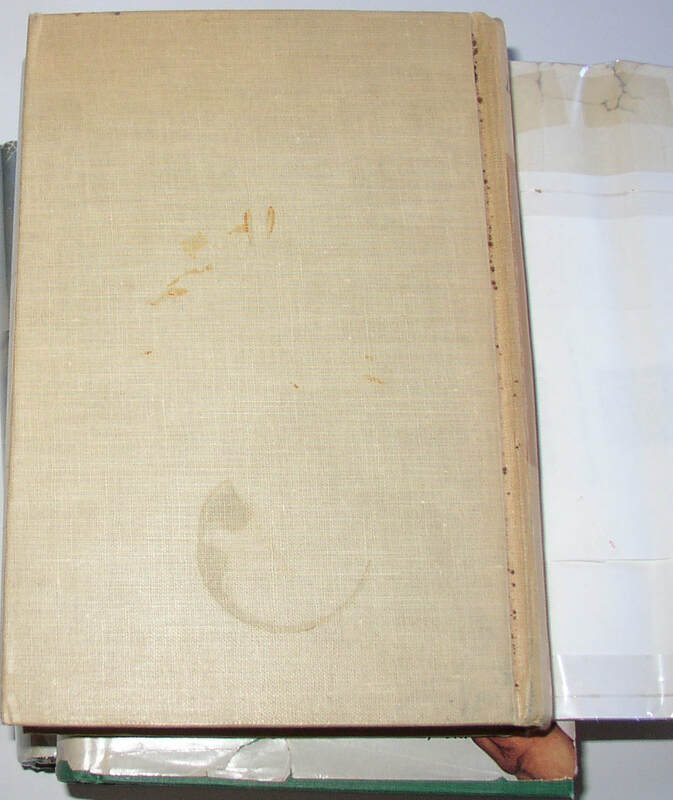 ; Ring Lardner, June Moon (Scribner’s 1930), about F/F; J. G. Cozzens, S.S. San Pedro, UK 1st edition (1931), with dust jacket and with scarce wrap-around band; Cozzens, The Son of Perdition, US 1st edition (1929), lacking jacket; Eugene O’Neill, Strange Interlude (US 1st, 1928) Near F/F; James Laughlin, New Directions in Prose and Poetry 1942 (1st in dj; NF/NF. Plus one book that is not a first edition, but may be a first as such: Longfellow;s The Courtship of Miles Standish (London: Nister, [1906? 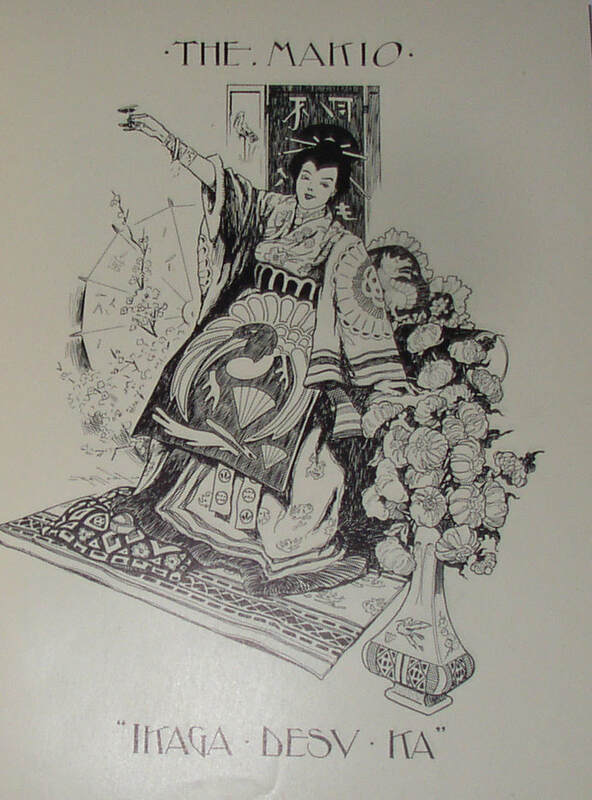 ], with scarce jacket covering a beautiful illustrated cover. NF/VG. Condition: beautiful copies, as a rule, with conditions as noted above. 495. 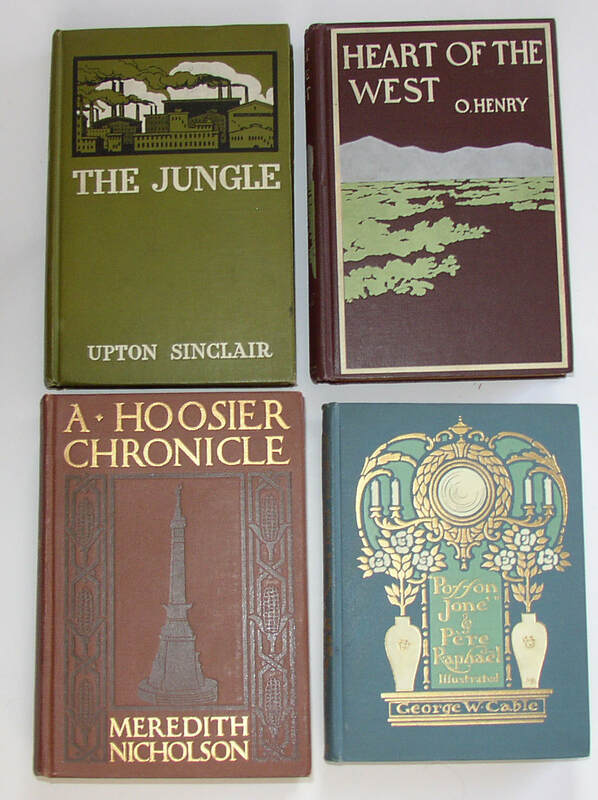 Eight literary 1st editions, mostly American: Upton Sinclair, O. Henry, George W. Cable, etc. Includes: H G Wells, The Common Sense of World Peace (London, 1929); E. C. Bentley, Trent’s Last Case (London, ); classic mystery. 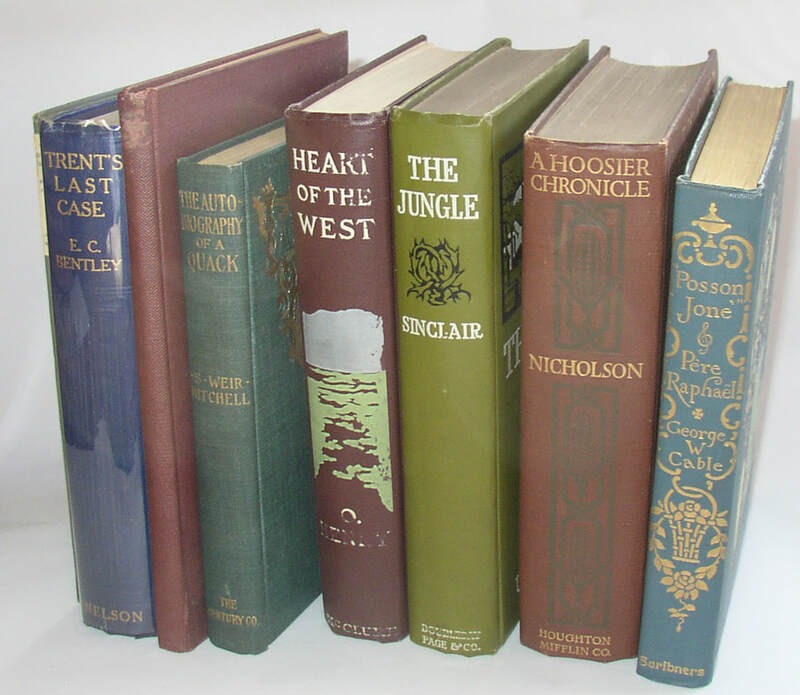 ; Elliott Blaine Henderson, Darkey Ditties (1915); S Weir Mitchell, Autobiography of a Quack (New York, 1900); Upton Sinclair, The Jungle (New York, 1906); O Henry, Heart of the West (New York, 1907), most of the painted decoration still present; Meredith Nicholson, A Hoosier Chronicle (Boston, 1912); George W. Cable, Posson Jone’ & Pere Raphael (New York, 1909) Margaret Armstorng decorative binding design. Condition: VG to NF, as a rule. Nice copies. 496. 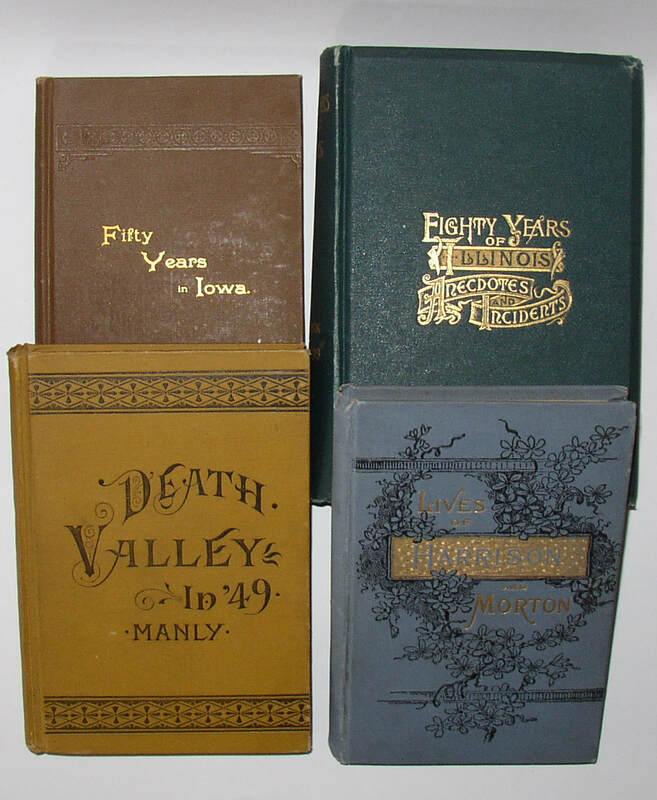 Eight Juvenile literature books, 1848-1888. Includes: Fletcher, Golden Leaflets (Nashua NH, 1848); a small book, about 4” tall; Goulding, Young Marooners on the Florida Coast (Philadelphia, 1852); large water stain on rear cover; Lucy Larcom, Similitudes (Boston, 1854); Oliver Optic, The Boat Club (Boston, 1855); The Seven Little Sisters who Live on the Round Ball that Floats in the Air (Boston, 1861, but with gift inscription dated “Christmas /60”); du Chaillu, Stories of the Gorilla Country (New York, 1868); Kellogg, Lion Ben (Boston, 1869); Percival Lowell’s copy, with his bookplate, and a Christmas 1868 inscription from his aunt; Burnett, Editha’s Burglar (Boston, 1888). Nice examples, as a rule. Condition: About VG on average, with specific issues here and there as noted above. 497. 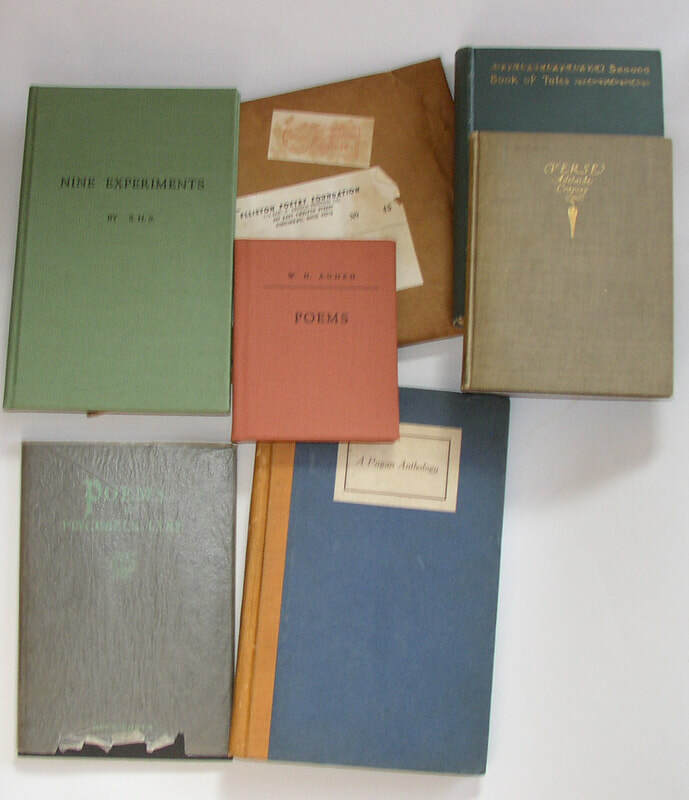 Eight literary 1st editions, signed by the authors: Conrad Aiken, Van Wyck Brooks, etc. 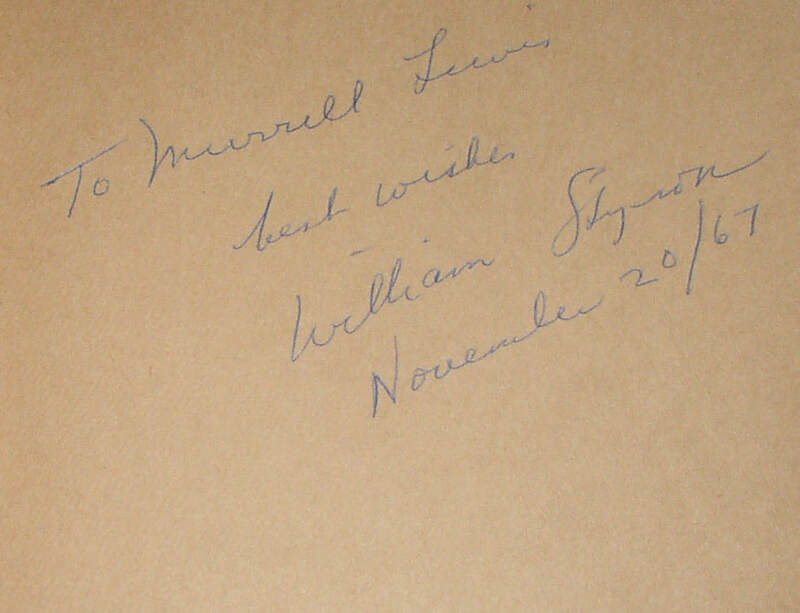 Includes: Conrad Aiken, The Jig of Forslin, (Boston, 1916); signed and inscribed on the front free endpaper by Aiken, no jacket; Phyllis Bottome, Stella Benson (San Francisco, 1934), signed and inscribed on front free endpaper, no dust jacket; Elinor Wylie, Black Armour (New York, 1923); signed and inscribed on front free endpaper, no dust jacket; Cyril Hume, Myself and the Young Bowman (New York, 1932) signed on the limitation page (1st in dj; a largish stain on the jacket, mildly affecting the book underneath); Van Wyck Brooks, The Times of Melville and Whitman and The World of Washington Irving, both signed and inscribed (to the same individual) on front free endpaper, both with dust jacket; Karl Shapiro, Trial of a Poet, no, 26 of 250 signed first edition copies in glassine jacket and slipcase. 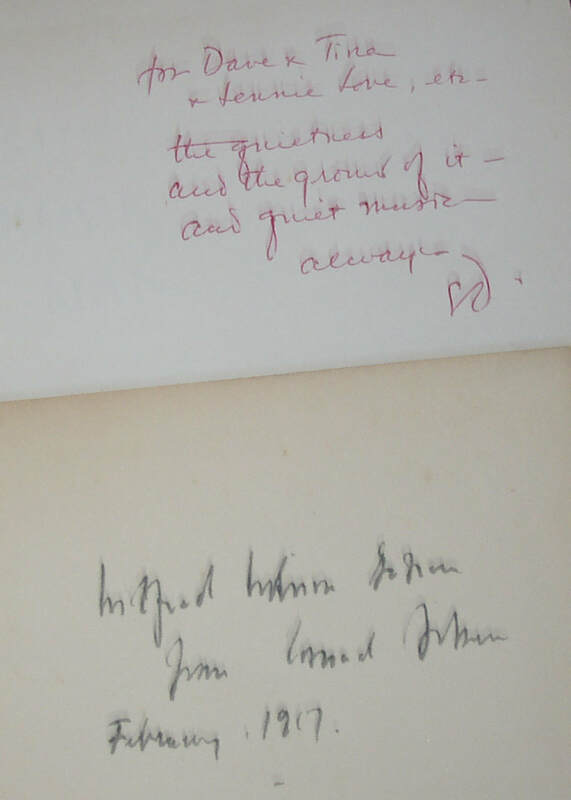 Cid Corman, Sun, Rock, Man, signed and inscribed on front free endpaper. Condition: Generally VG to NF, but with specific issues as noted. 498. 13 literary 1st editions, mostly poetry; some limited. 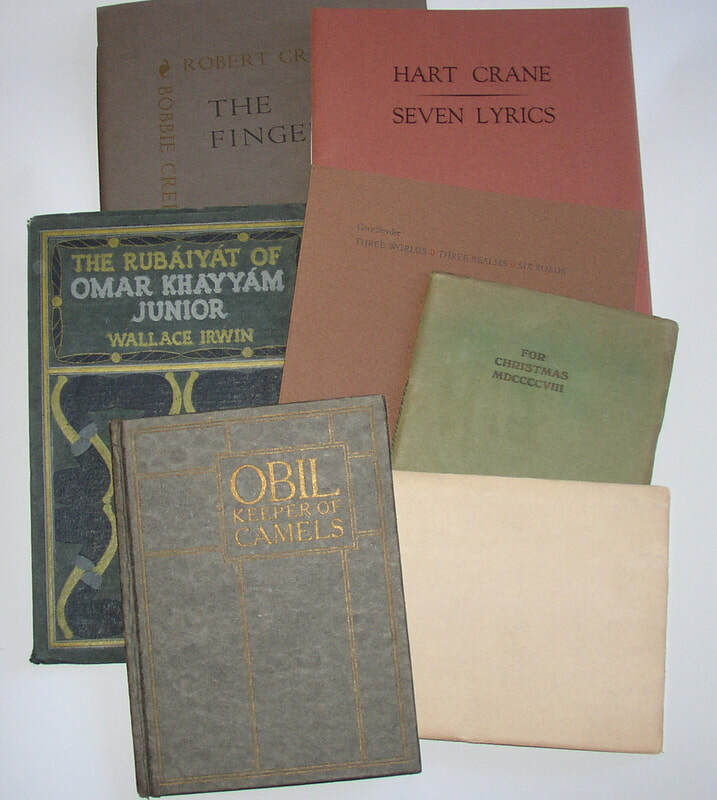 Includes: Eugene Field, Second Book of Tales (1896); Adelaide Crapsey, Verses (1915); [Hart Crane and others], A Pagan Anthology (1918) scarce, with wear and bumping; John Cowper Powys, Dorothy M Richardson (1931) bookplate; Pinchbeck Lyre, Poems (1931), in glassine jacket; Lawrence Durrell, et al, Proems (1938); Oliver Wells, Anthology of Younger Poets (1934) in glassine jacket; Contemporary American Men Poets (1937) no dust jacket; Reps, Gold/Fish Signatures (1962); in slipcase; Facsimile Reprints of Auden Poems and Spender Nine Experiments (1964) in original mailing envelope; Lafcadio Hearn, Tale of the Porcelain-God (1973); Harriman Spoon, Scatastrophes (1981). Some unusual items in this lot. Condition: Mostly NF or better, some not quite so good. 499. 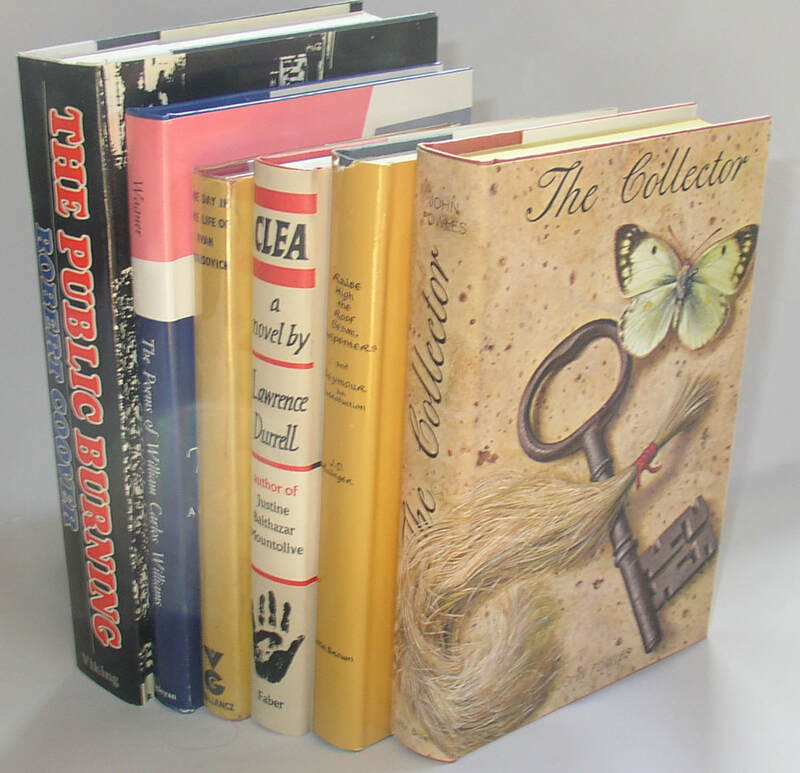 Two Limited Editions Club books and some other books in cases. 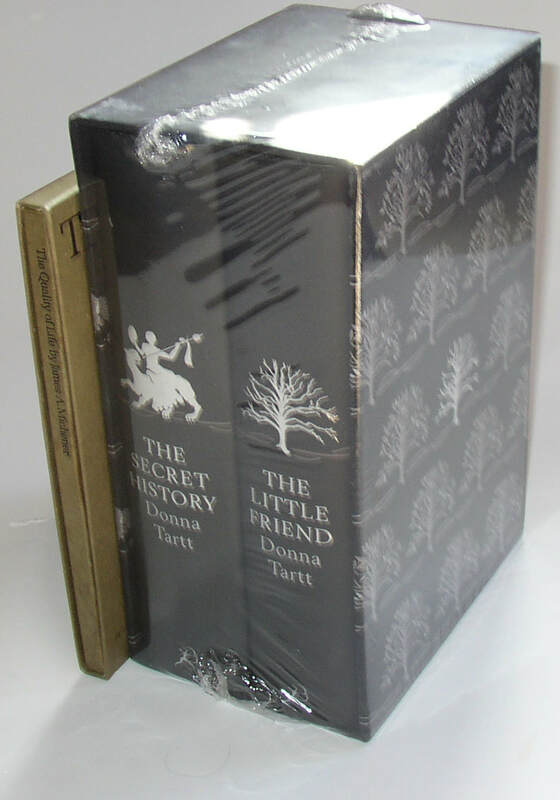 Includes: LEC: Dostoevsky, A Raw Youth (two volumes in glassine jackets and slipcase); LEC: Short Stories of Charles Dickens (glassine jacket and slipcase); with: Michener, The Quality of Life, in slipcase; and Donna Tartt, Limited edition of The Secret History and The Little Friend, one of 1000 copies, both signed, as noted. 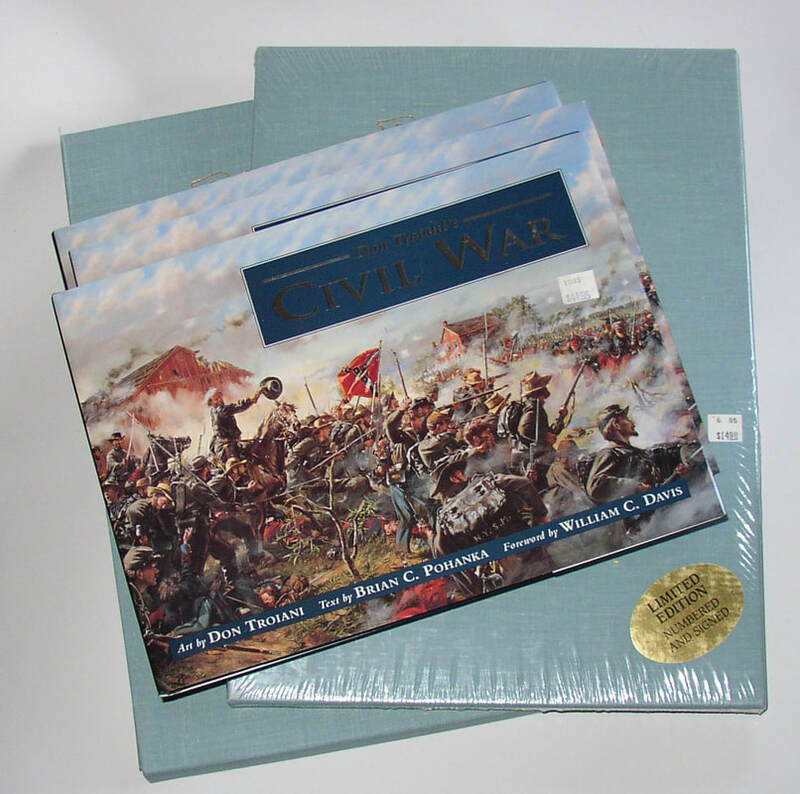 In original shrink-wrap. Condition: All four items close to F/F. 500. Numerous boxes filled with old bookseller’s catalogues and correspondence. Condition: Used, and probably in a range of conditions.